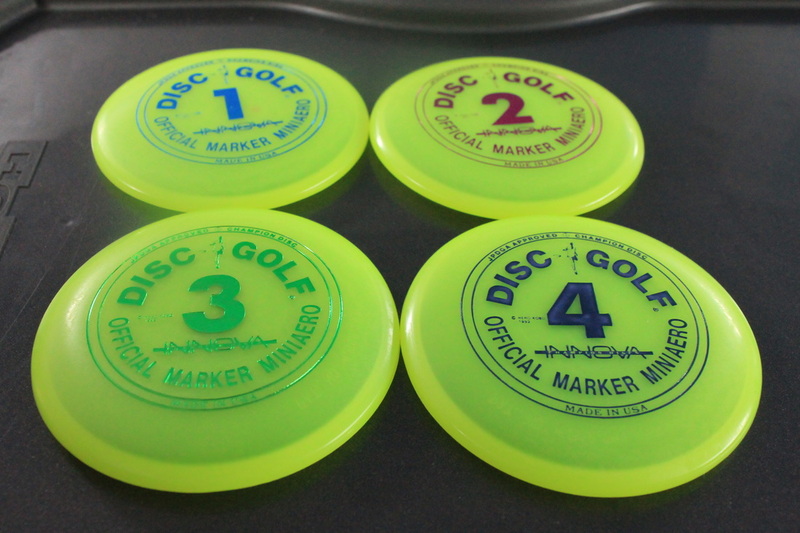 Discraft Minis. 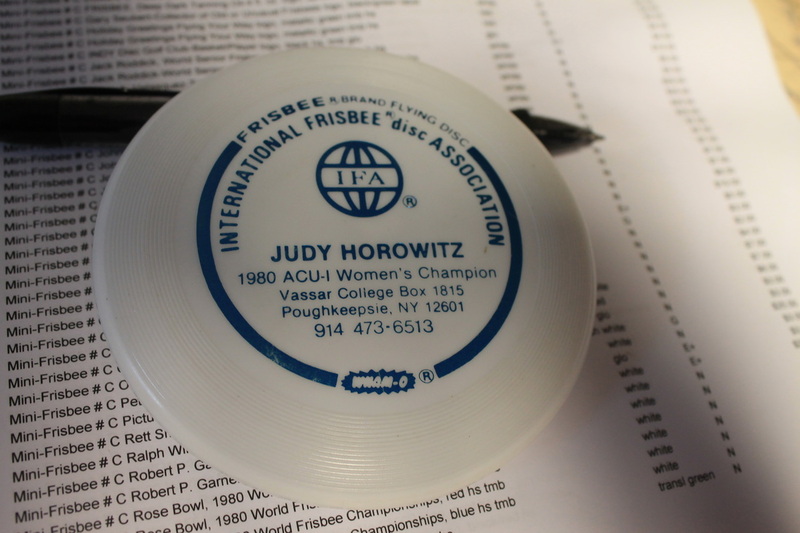 Bijou started tournament play in 1996. Thanks to Craig Getty for the Tahoe minis! 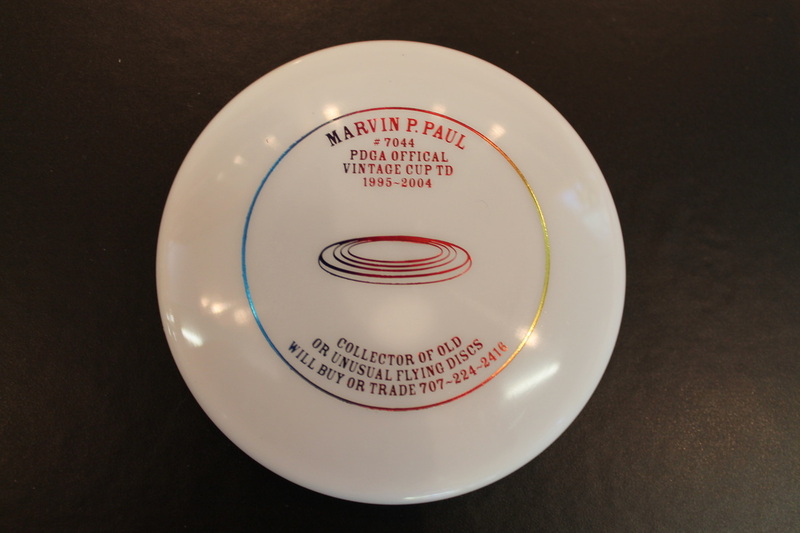 This course went in 1999/2000 this Innova mini is from 2001. 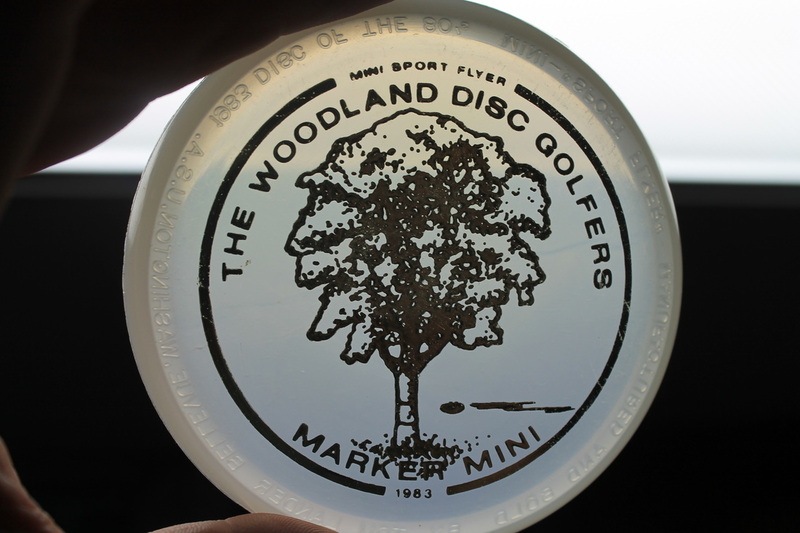 Disc Sport Mini Pee Wee from New Zealand. 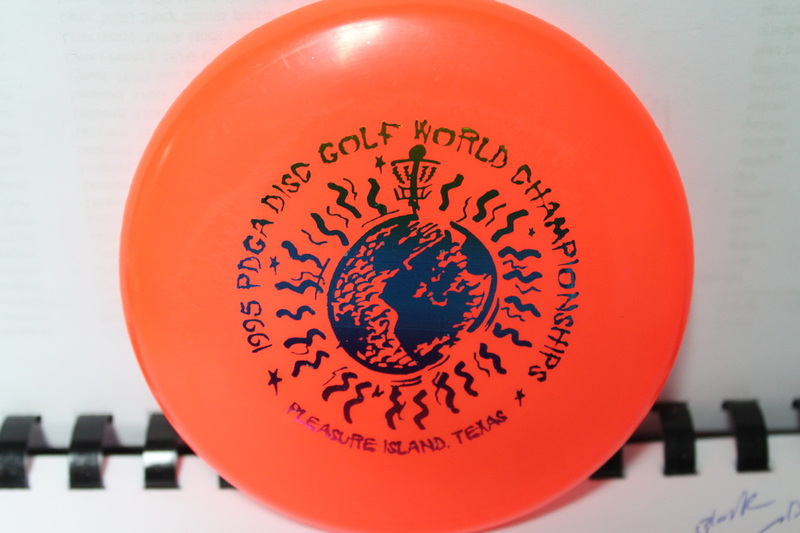 Disc Sport Mini Pee Wee, from New Zealand. I got this from Ed Headrick's collection, so it is older, info I got is that it is a Tom Boda bag. 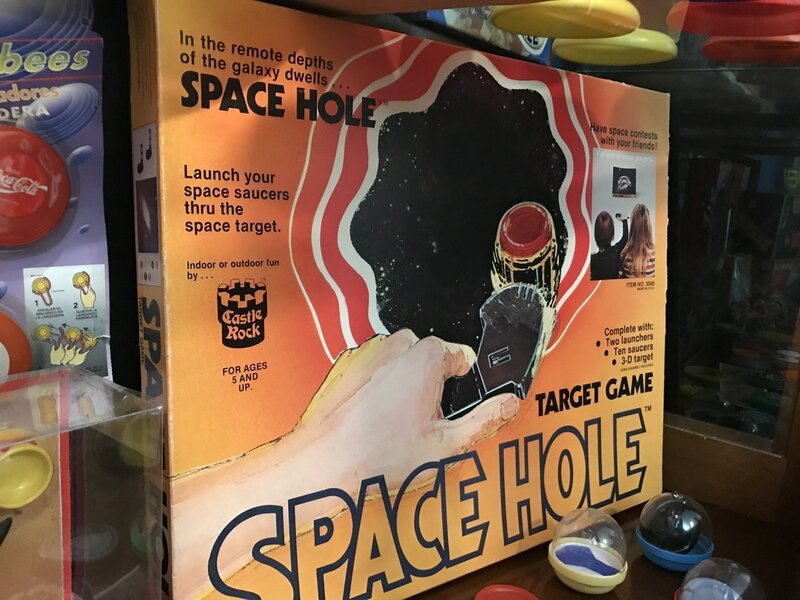 Circa1980s. Let me know if you have other info! first 3 of a run, left & center are short shots, right is a complete shot, as the run went on the minis became darker blue, ZING Microfoil. ZING mini test shot made with wood. 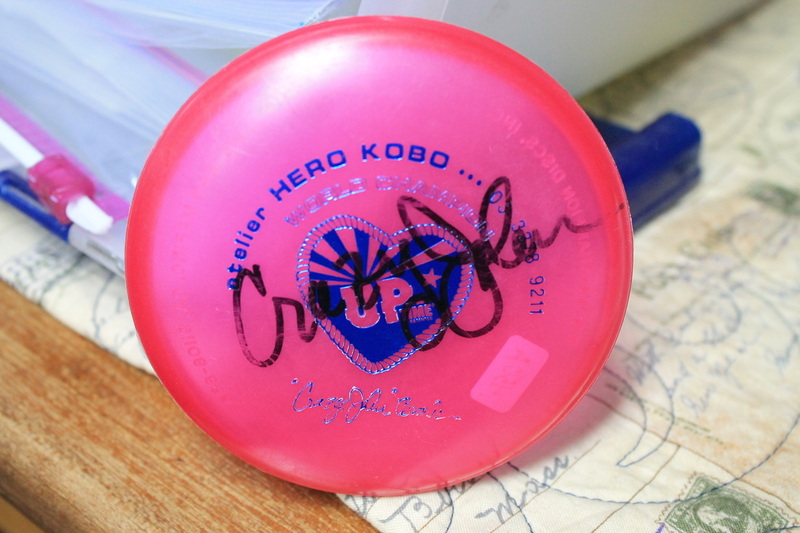 Mini-Star Super color, Discraft, signed by Doug. Japanese with comic character labels. 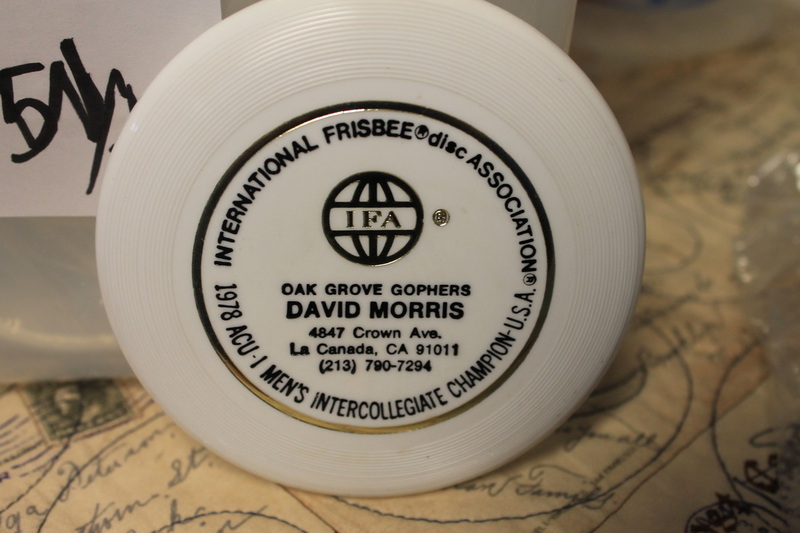 Innova mini, I value at $40, I am going to start giving values to my collection, I know starting out Victor's book was very helpful to me as a price guide! Over time I will have values on all my stuff! From the collection of Dudley Gaman. 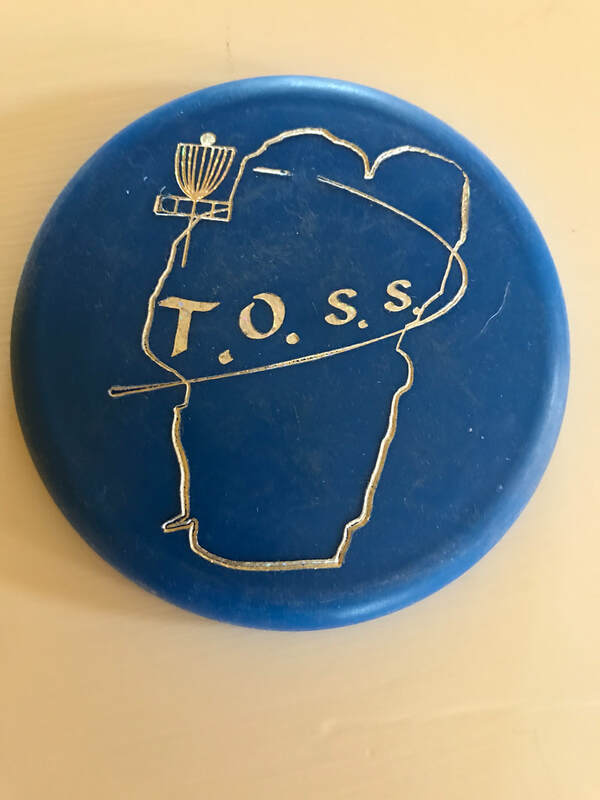 From the collection of Dudley Gaman, if I remember right, this toy is the first to use the term Flying Disc, made around 1920 into early 1921. 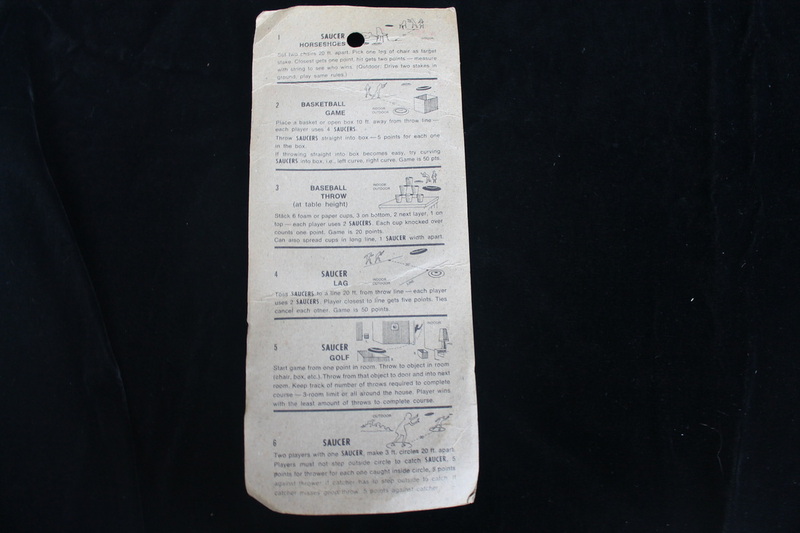 From the collection of Dudley Gaman, mini set with hand held launcher. Someone always gets custom minis around my house at the holidays, this year was Ryan, Glow, blended, Star, DX & Metal Flake plastic! 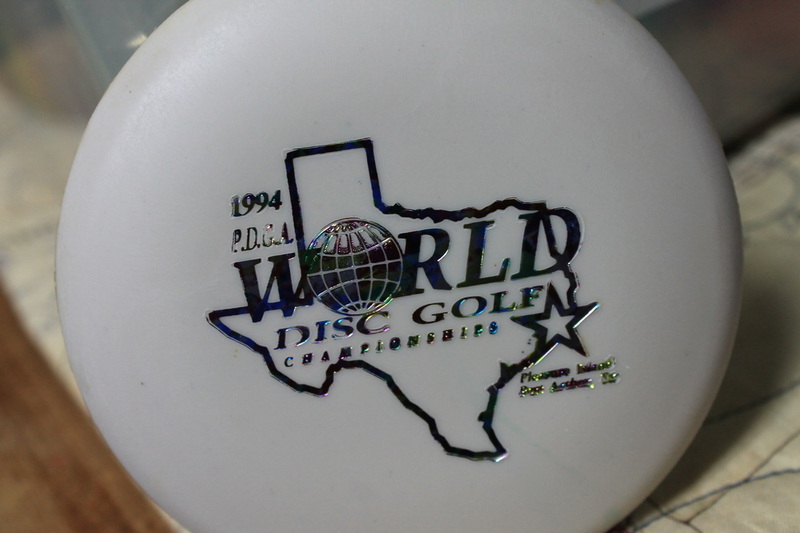 Wham-o D mold, tuff to get a good shot of the brown disc with a worn stamp. Trophy minis from the collection of Charles Burke. 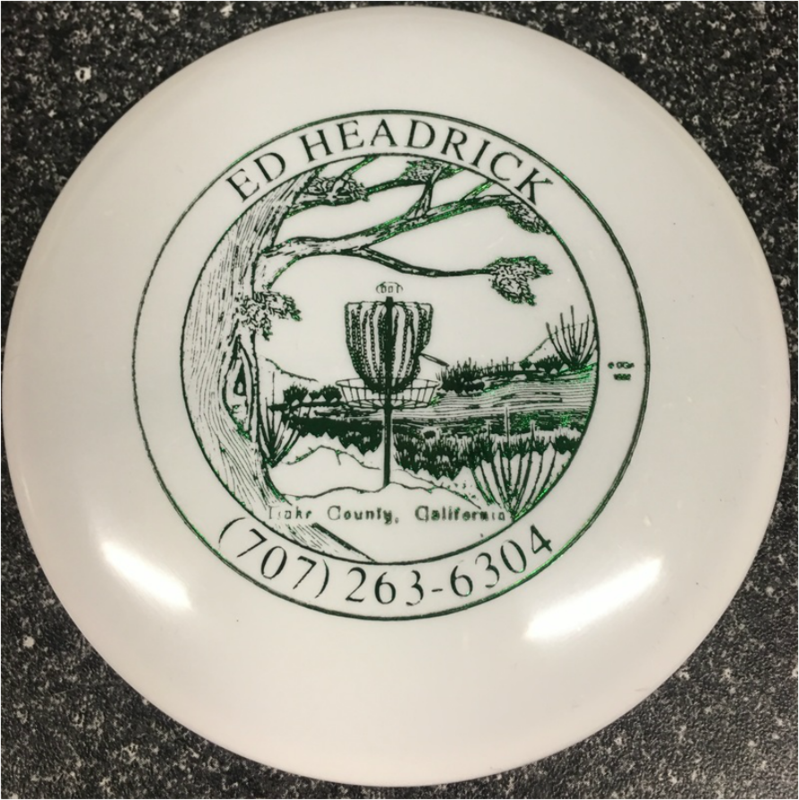 Innova mini with Ed Headrick Lake County logo. 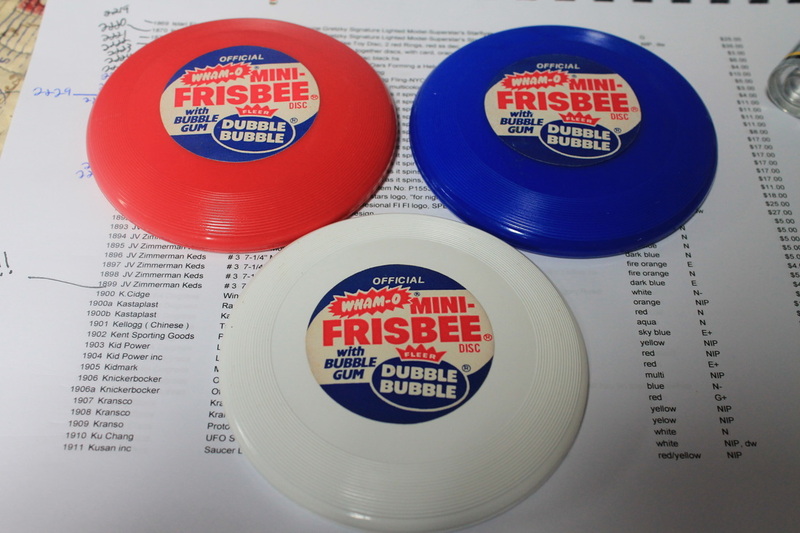 Wham-o minis with a Fleer Dubble Bubble paper logo. 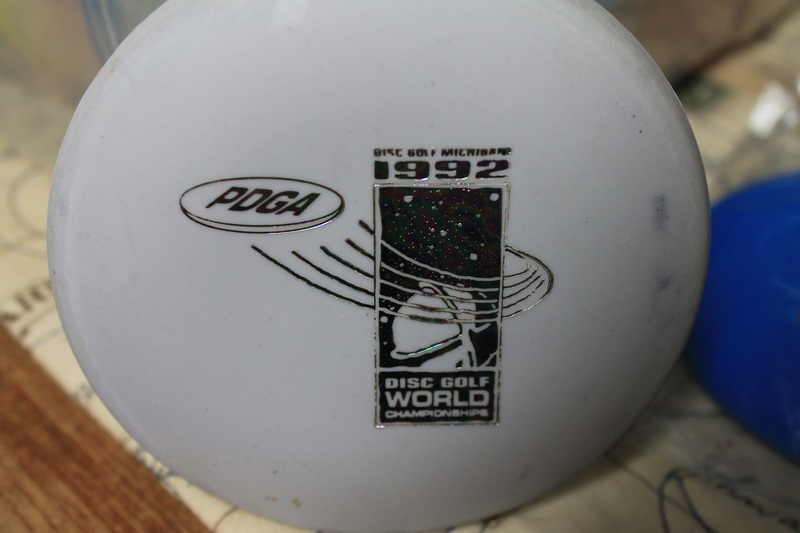 Glow mini set with the 1992 Doubles Championship logo, Rare Innova Header Card. 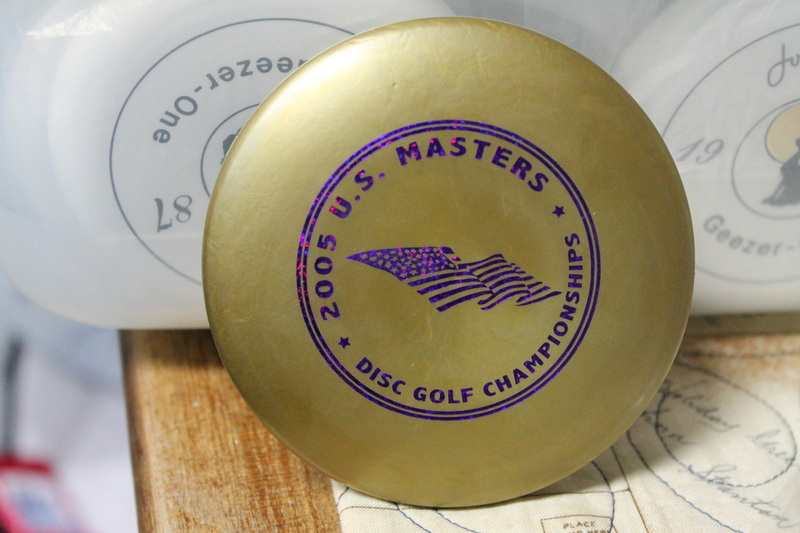 Dynamic Discs ( 2012 ) Mini Dye MAX Judge. 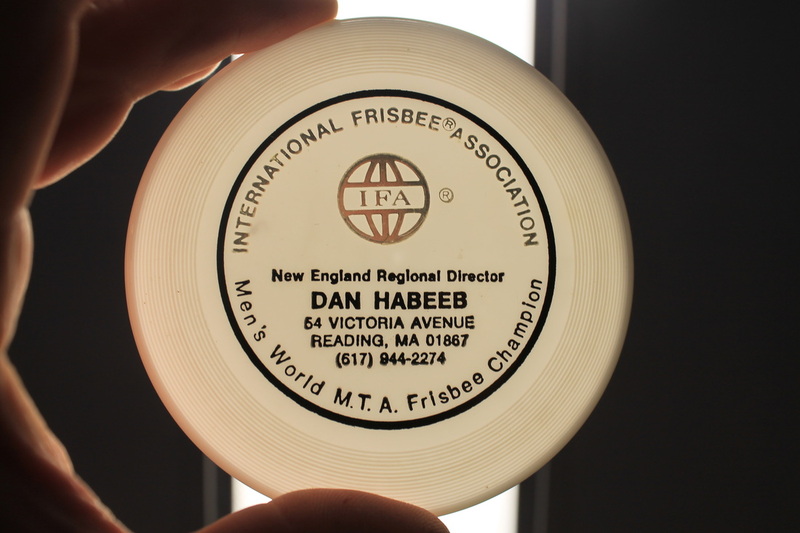 Innova mini, Heavy, no script on underside. 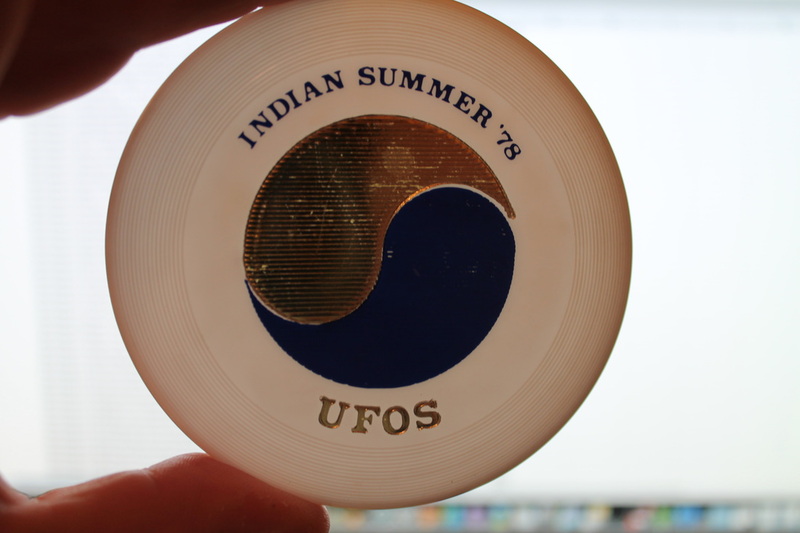 Unreleased Sixlets label on a Wham-o mini. 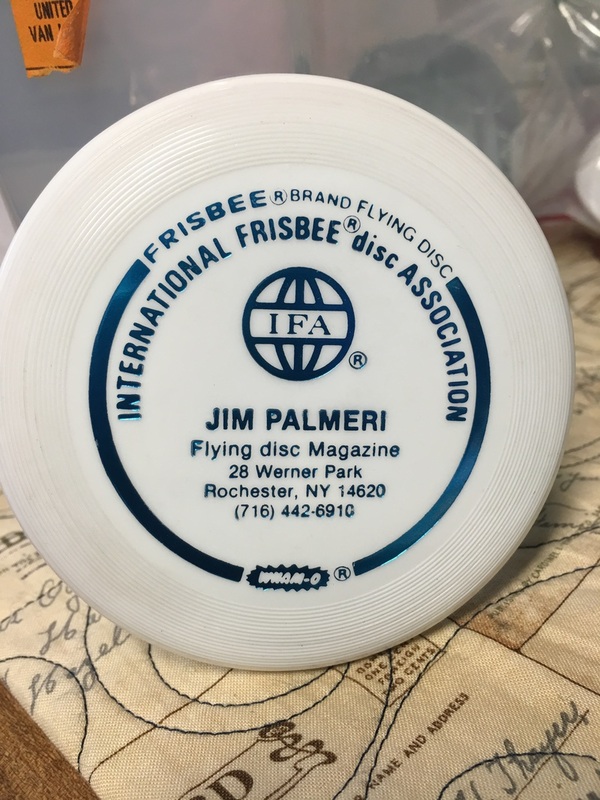 Below you have the first run stamp used on the minis, well this one has the addition of Tim S & street address, what I am pointing out is the larger solid band on the disc below caused drop outs on the stamp, you can see one! 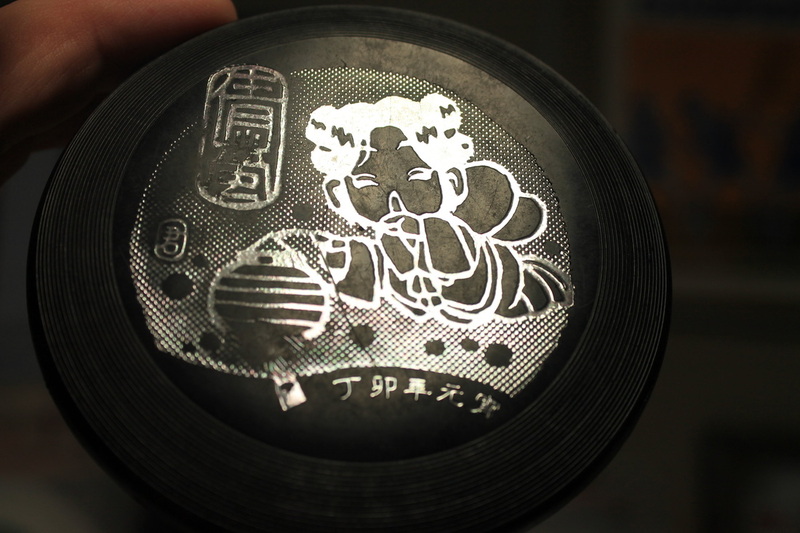 above on the second run of these the stamp was changed to the double ring. Hard to find Tim Selinske minis. Top a San Marino mold, bottom a heavy Ontario mold. Mini Bar stamp on a San Marino mini. 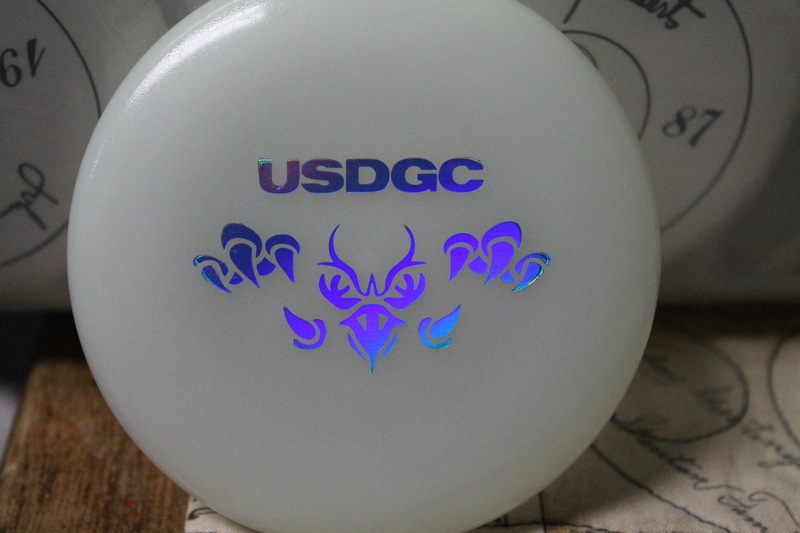 Innova mini 1-4 set with a JPDGA logo. 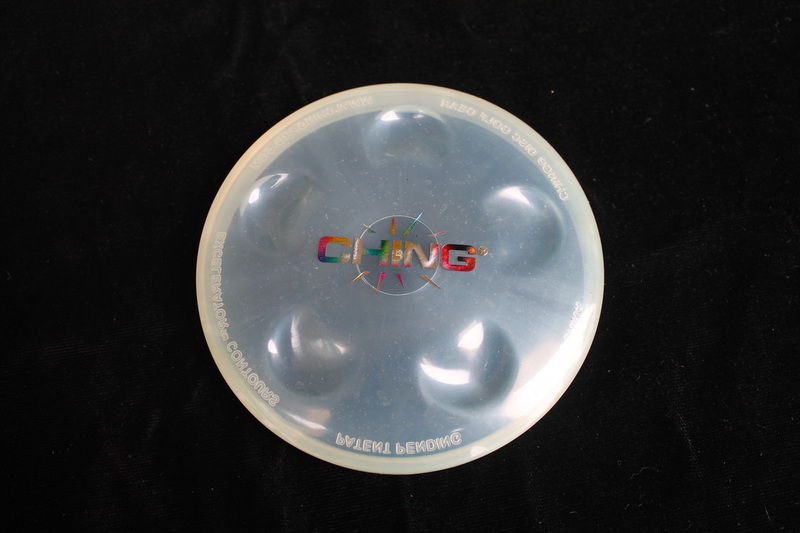 Clear, blank San Marino mold. 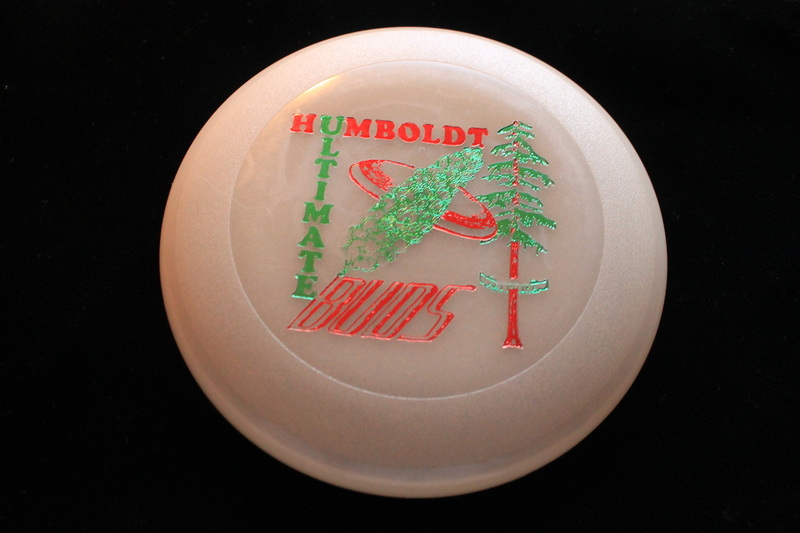 art on a Innova Ontario mold mini. 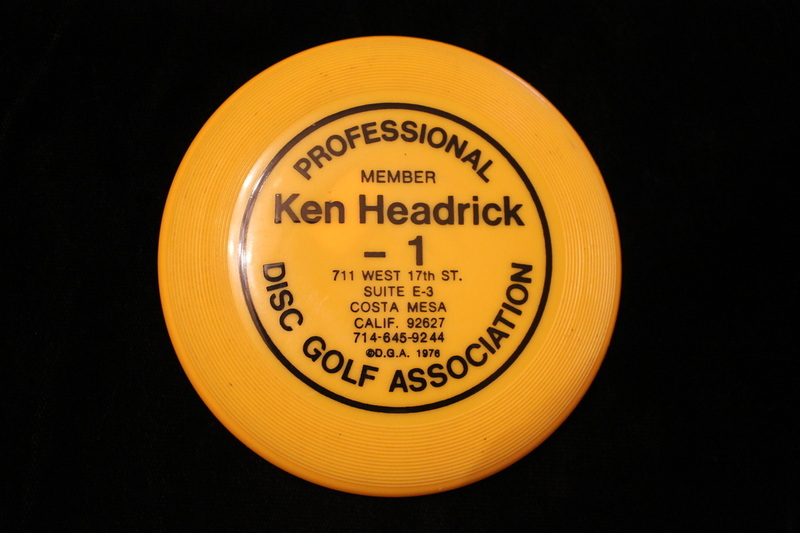 Old school Ontario mold, love this course! 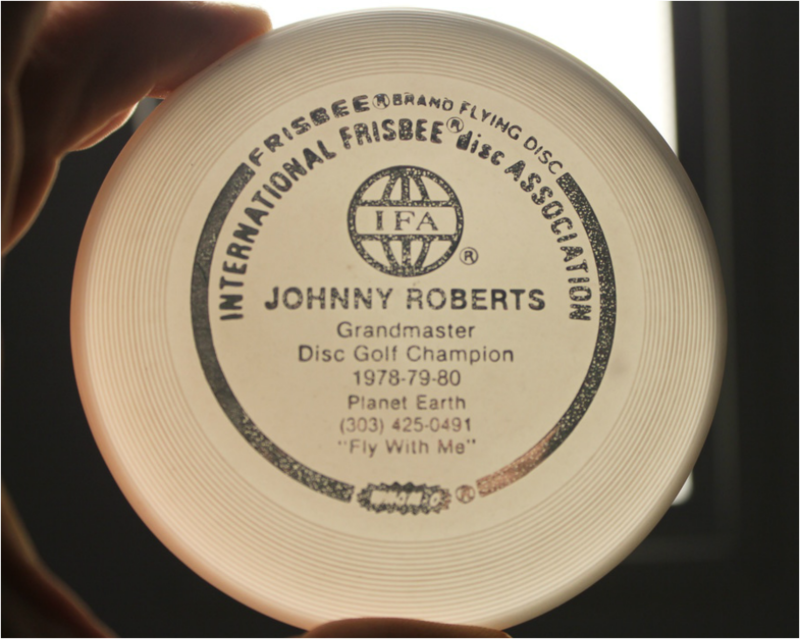 Wham-o mini C mold , thanks to Josh Gelman for the disc, Gosh was a charter member of the New York Flying Disc Institute, he tells me that this address for Peter is the Dakota building, where John Lennon was shot. Donn Blake started this group, he had saved some of the early numbers, 2 is my lucky number. 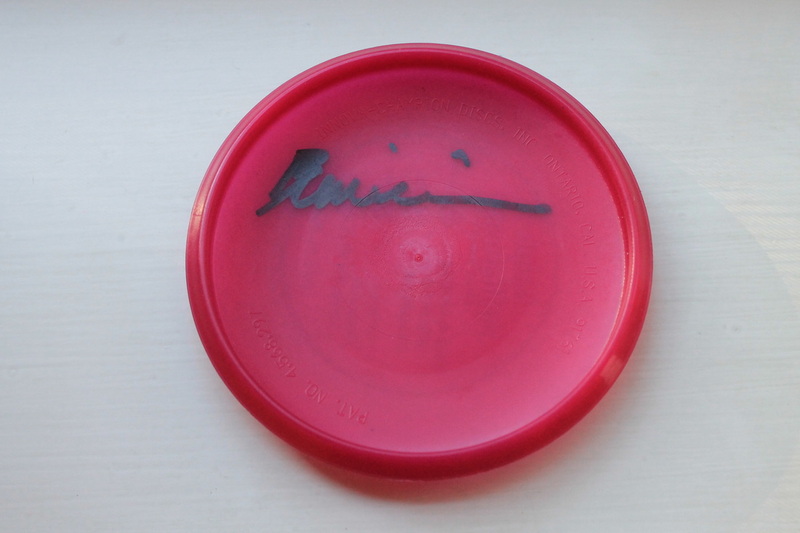 Wham-o mini signed by Disc Golf great Dean Tannock. cool C mold! 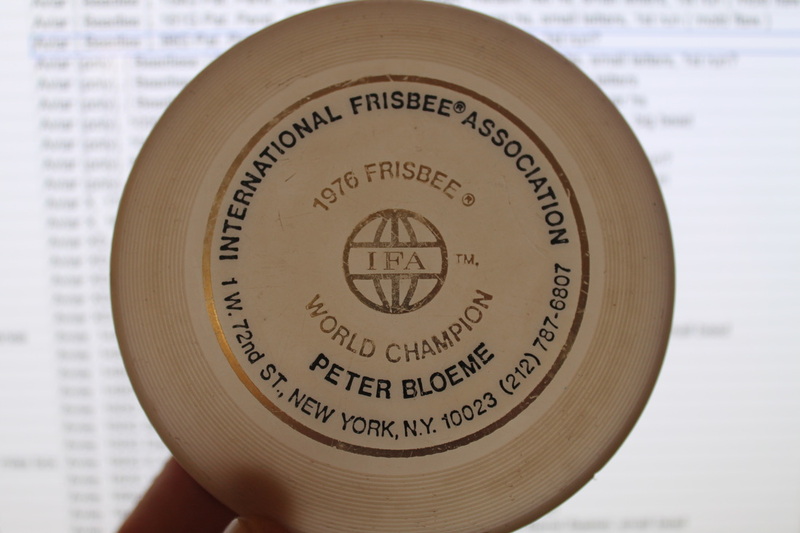 Hard to see Jay and Sue Beukelman World Class Masters 1980 European Frisbee Tour. Wham-o/Tsukuda ( Japanese ) mini disc # 30 AT. Wham-o/Tsukuda ( Japanese ) mini disc 30 AT. 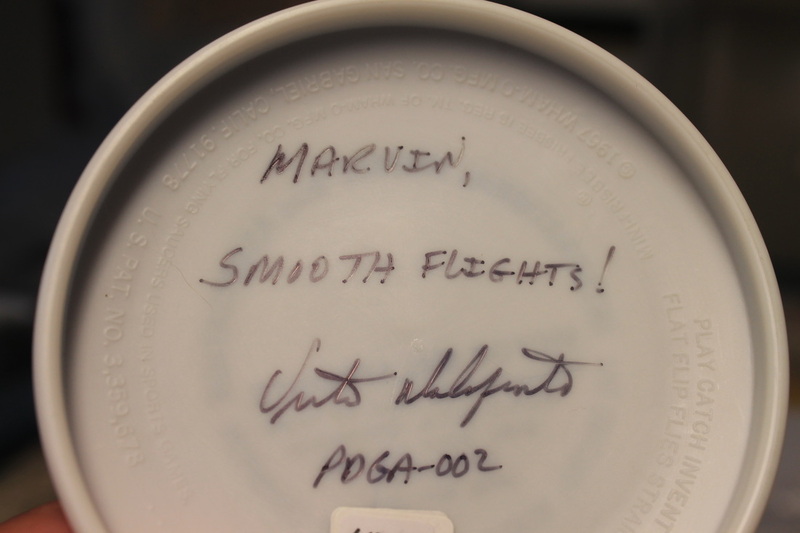 From the 1984 Los Angeles Olympics, Wham-o pocket Pro 31 C mold. as you can see above the package on the Sam The Eagle Pocket Pro's is super clean this green one seems to have some kind of early packaging experiment! How the disc is stuck to the card is kinda ruff! Nice set of New In The Package Pocket Pros! Pocket Pro greeting card comes with mailing envelope. 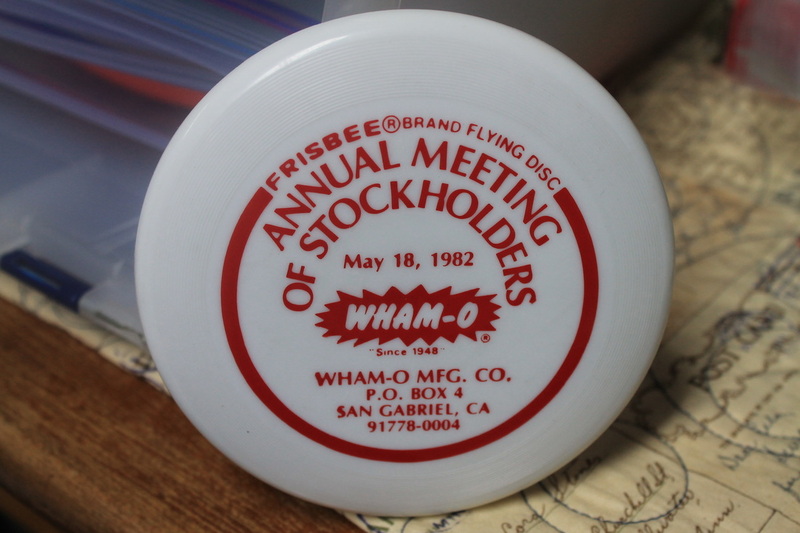 Wham-o Pocket Pro 30 A mold with a classic logo. Wham-o Pocket Pro 30 B mold, looks like this label was added to the mini. Wham-o Pocket Pro 30 B mold. 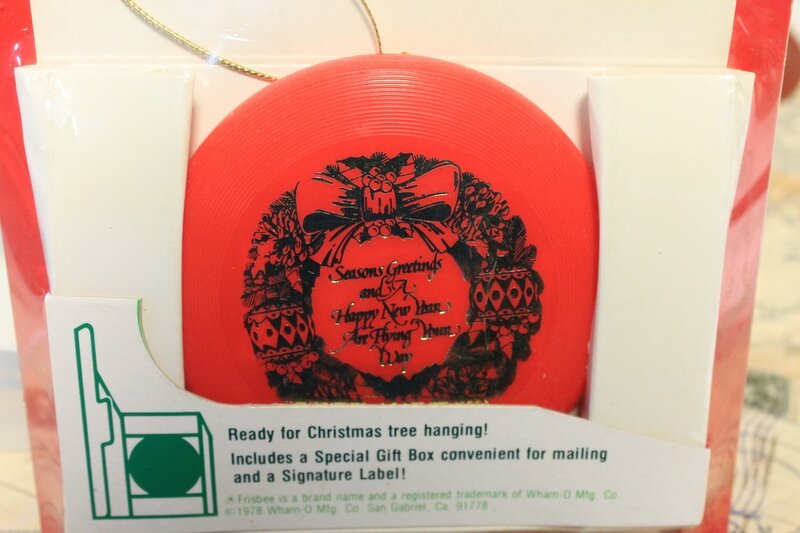 underside of above Christmas disc. 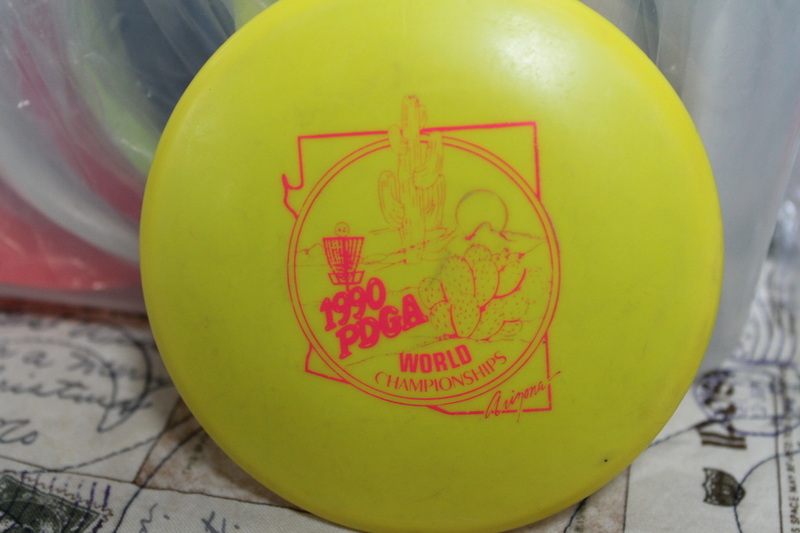 Wham-o Pocket Pro with a Zinger tm in the trademark band, 31 D mold. Wham-o Pocket Pro 31 C mold. 1999 World's Biggest Weekend, Wham-o minis. Wham-o mini H mold raised lettering. Wham-o mini D mold raised lettering. 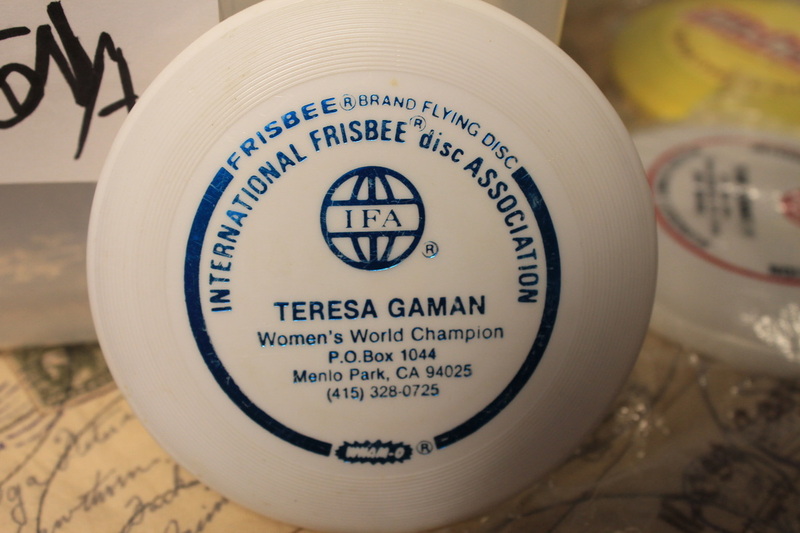 Wham-o mini F mold Olympic label, raised lettering. 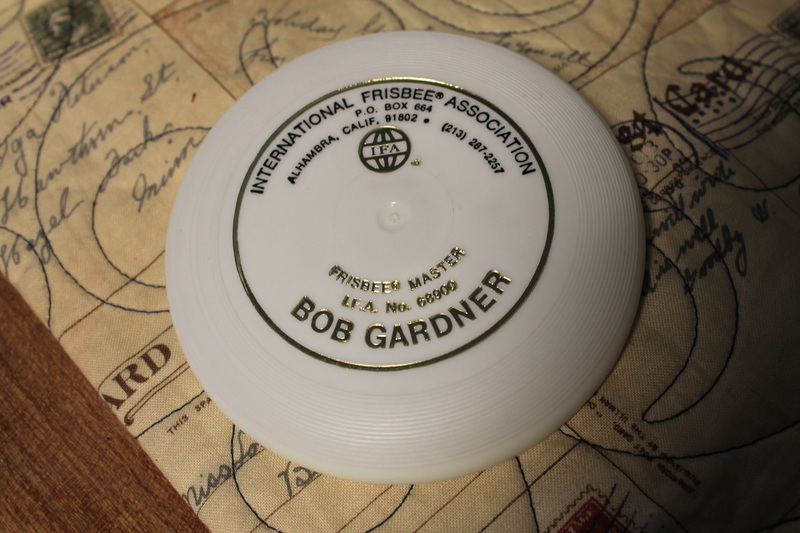 Wham-o mini D mold with a unusual Union Federal Savings label, raised lettering. Wham-o mini B mold, raised lettering. 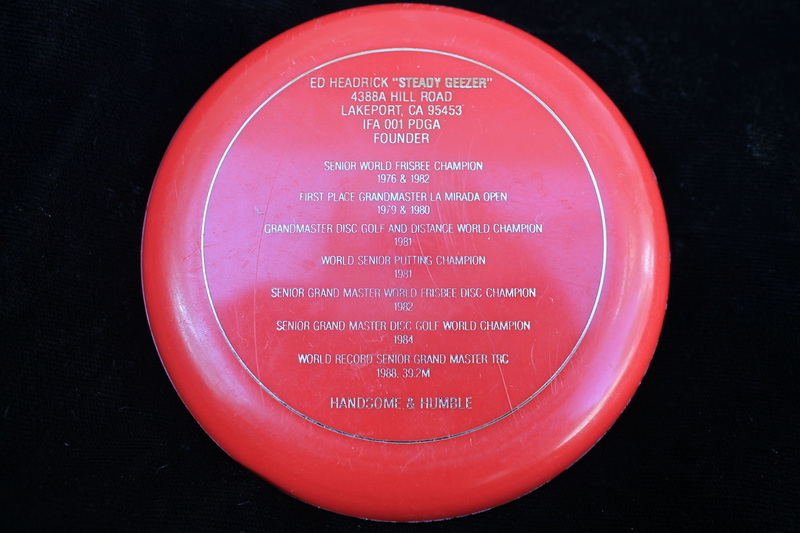 Wham-o mini B mold with 2 over 3 label, raised lettering, the officials from the Olympics made Wham-o stop using their 3 over 2 ring logo so Wham-o just flipped it over . 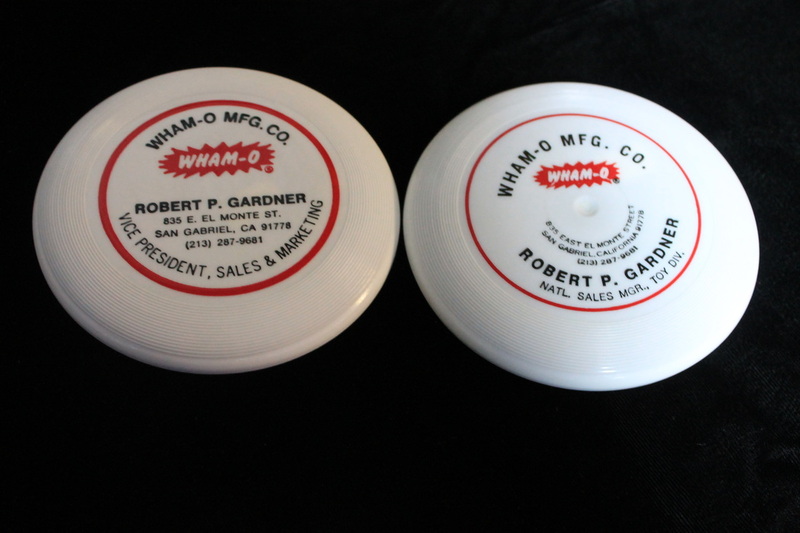 Wham-o mini A mold with 2 over 3 label, raised lettering. 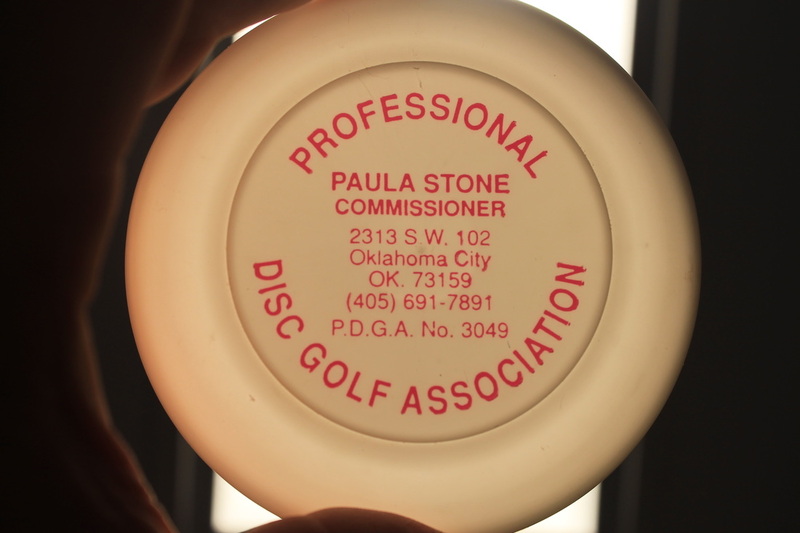 The underside of the above disc, Note the PAT. PEND., this is from the first run of Wham-o minis, this is the only one in my collection! Thanks for the heads up Dudley. Wham-o mini A mold raised lettering. 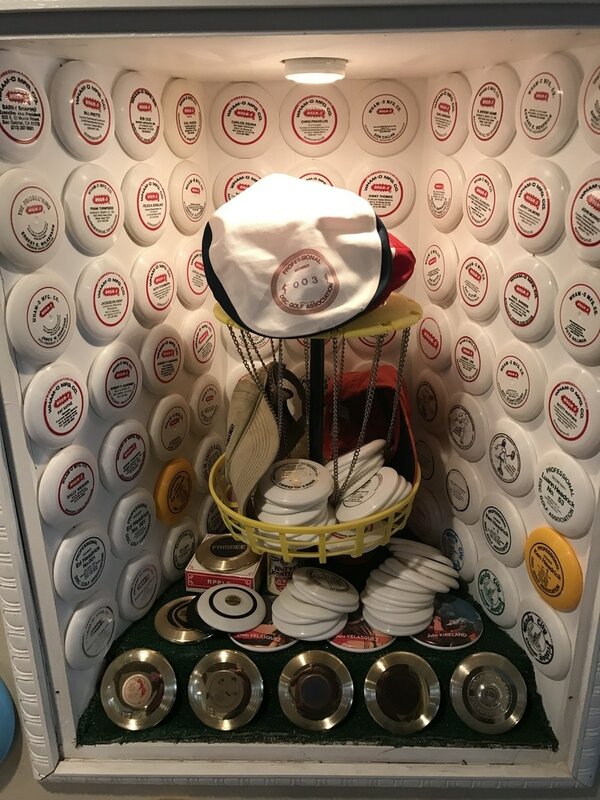 Early Wham-o minis had rings on the cupola, then they were removed like this one, later a blank space, no lettering on top but with a dimple, later a blank with no dimple. Thanks again Dudley. 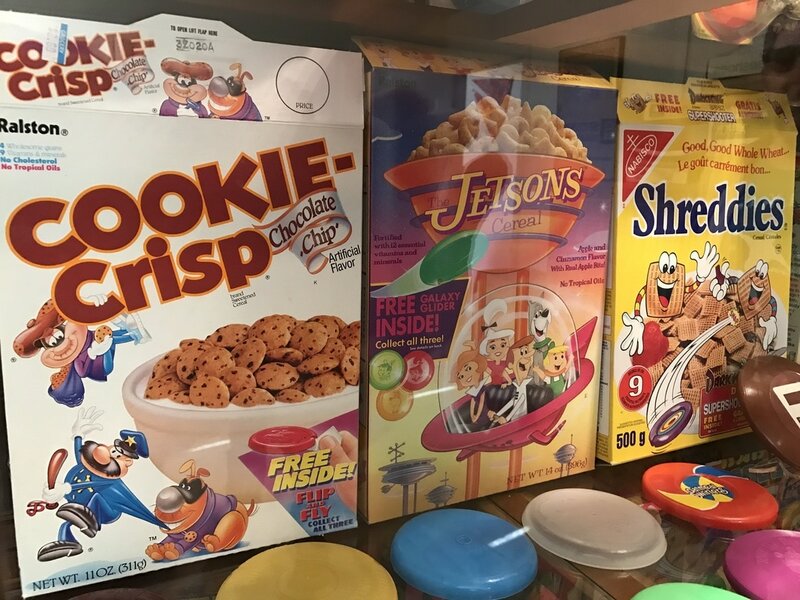 Kransco ( Wham-o ) raised engineering, Tony The Tiger image. F 10. 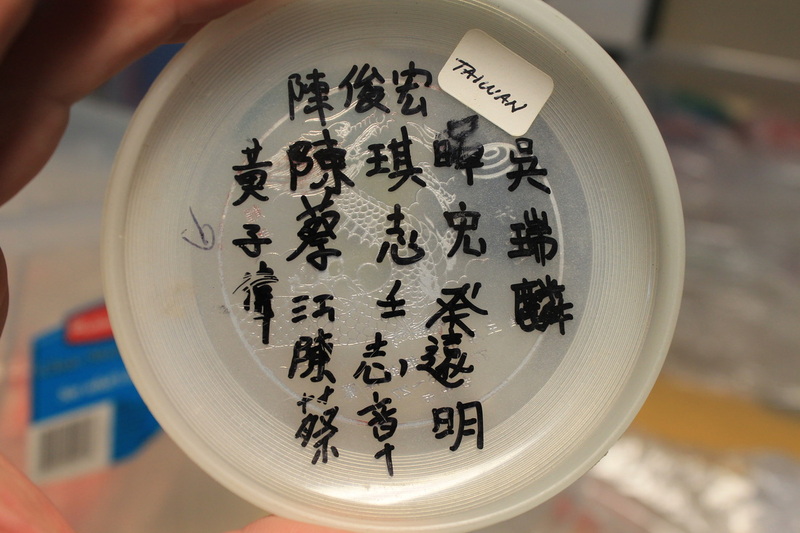 I do not see a mold letter, could it be because it is from England? Thanks For the mini Jeremy. 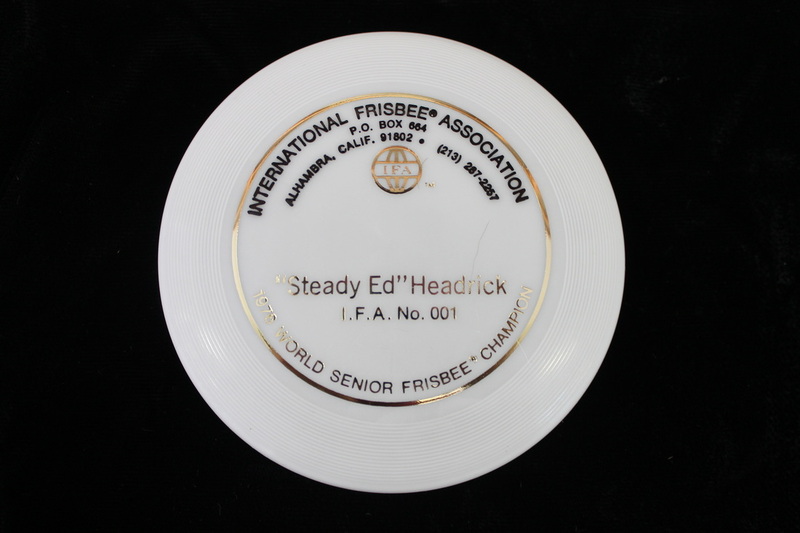 The Gaman's came over to look at plastic, Dudley had not seen one of these before so now it is in his collection! 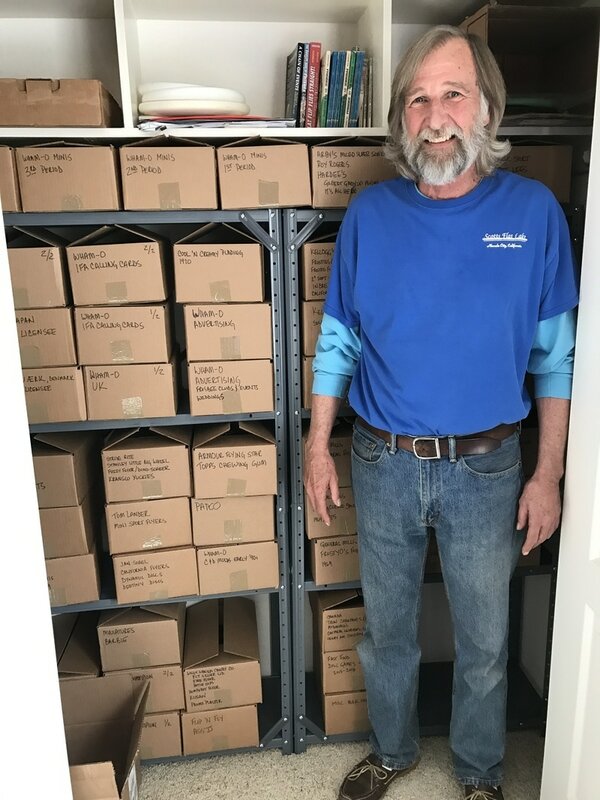 Dudley and some of his mini collection. 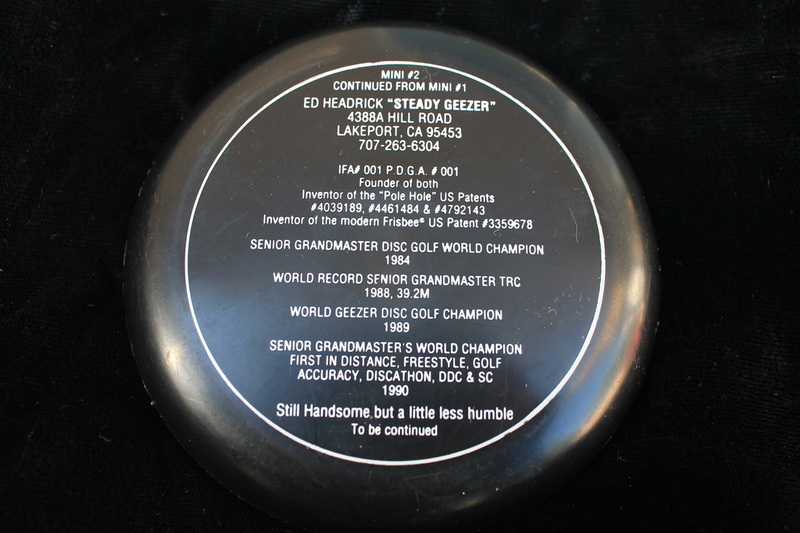 Wham-o mini D mold, the story of the Champ and the collector. 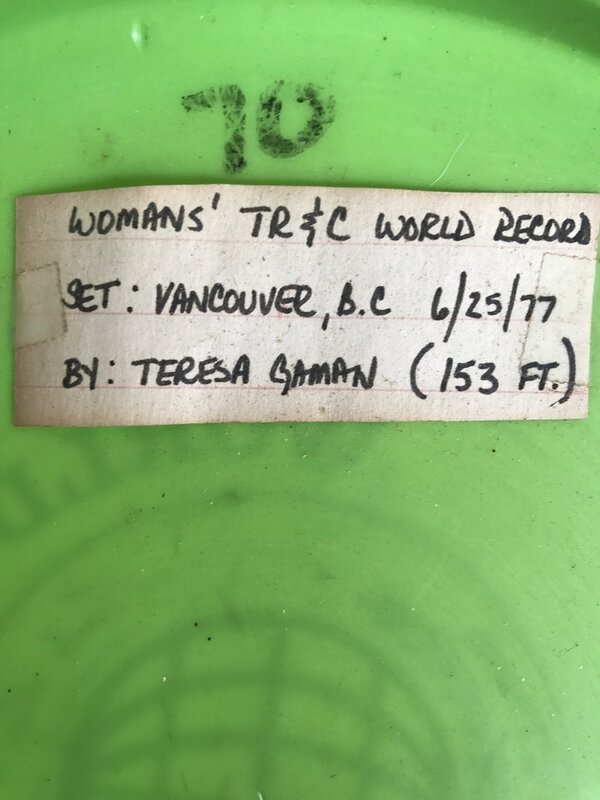 Teresa holding her disc used to set a TR&C record in 1977! 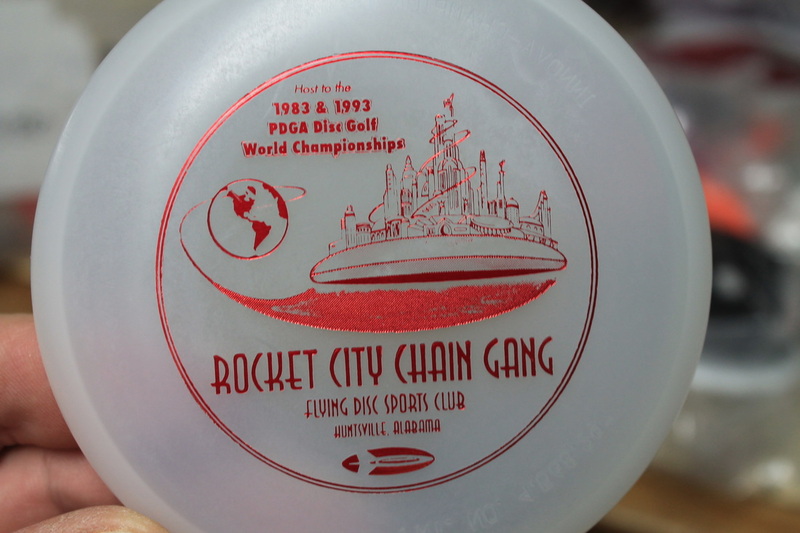 Raised Lettering on a C mold Wham-o mini. 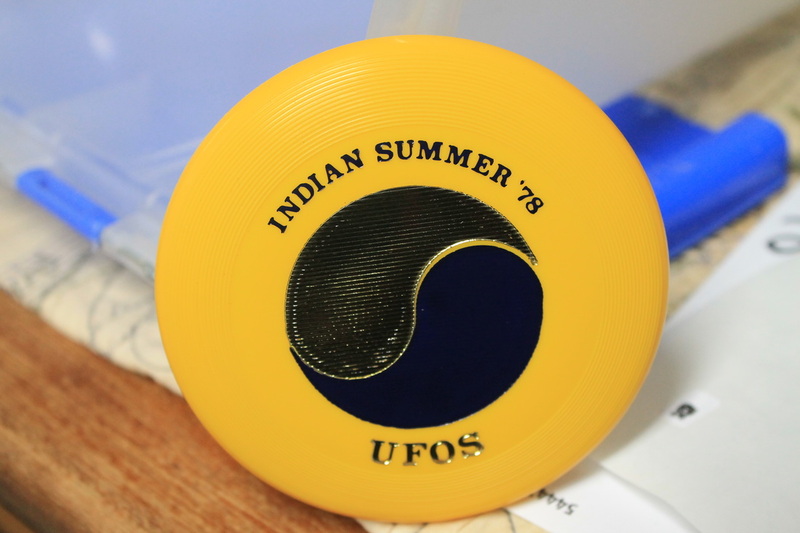 the order made for Indian summer 78 was mostly white but there were a few yellows as well. 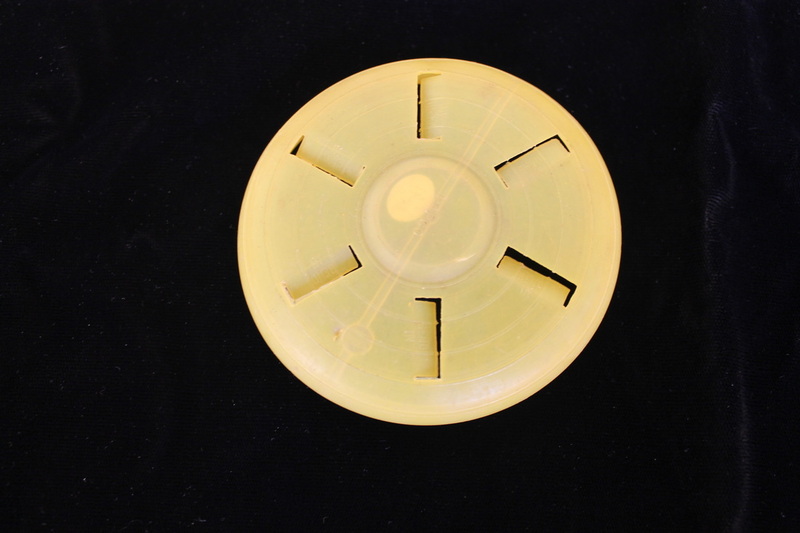 Wham-o mini D mold. 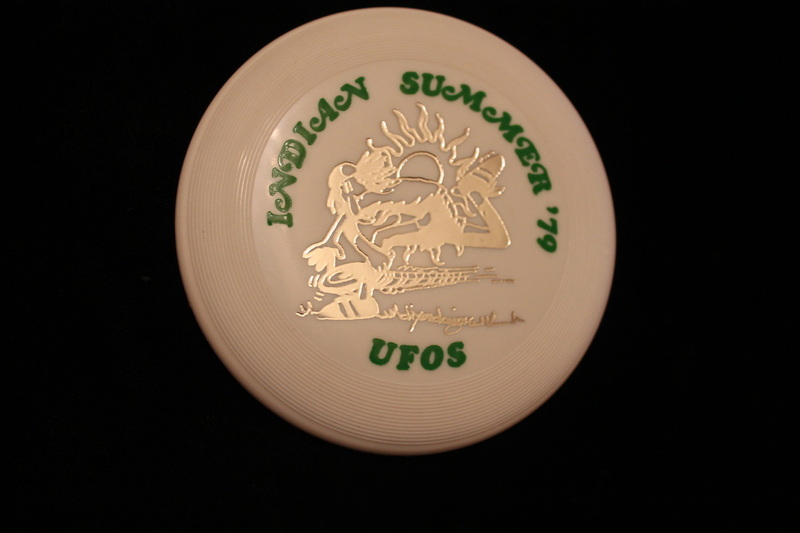 In my area the United Flyers of Sonoma have a long Frisbee history! Wham-o minis top 2 are C molds and bottom is a D mold, love this paper label with 3 Piddiling Figures! 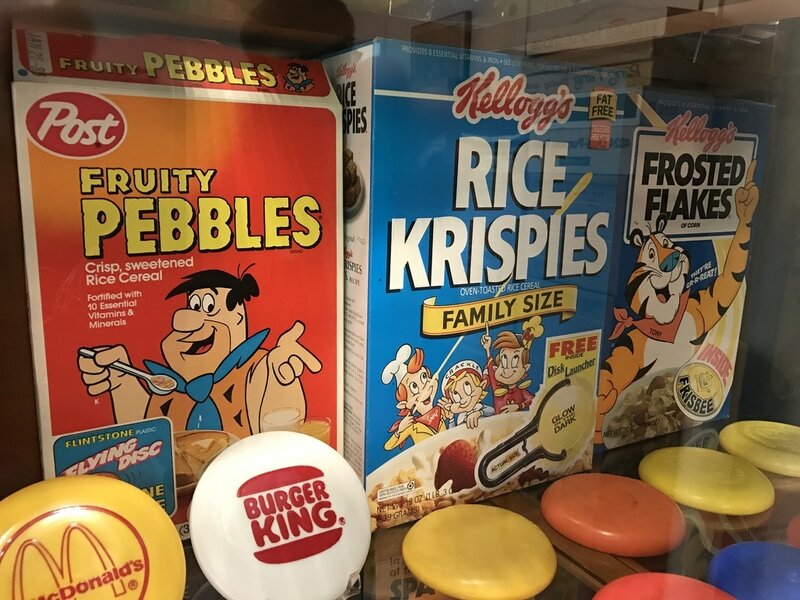 The figures are Bill King, John Anthony and Jim Brown. 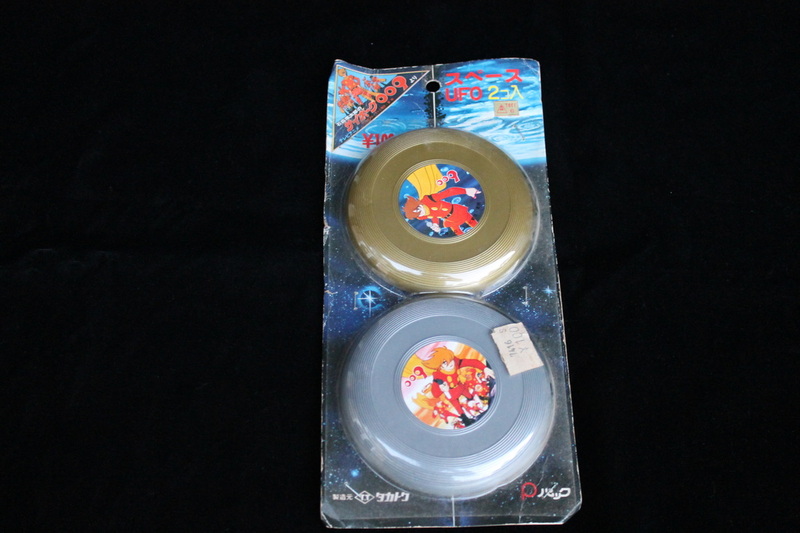 Wham-o mini C mold, I really like this artwork with the Pluto Platter and the Ying Yang. trying to find the story on this C mold. Sheryl is the wife of Doug Newland. Wham-o mini C mold, this one came with a bottle of tanning oil. 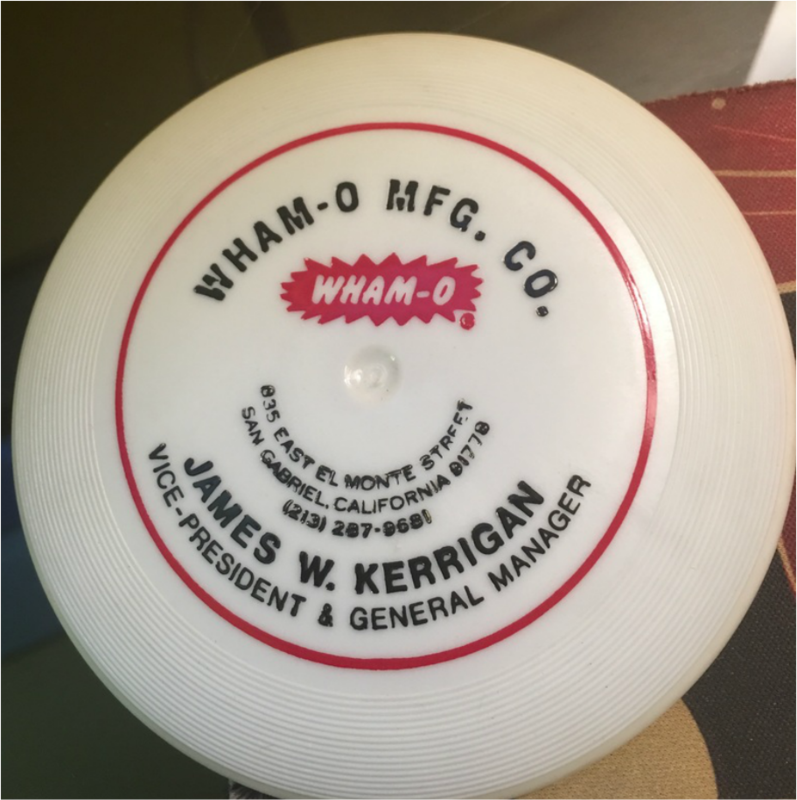 Wham-o mini C mold. 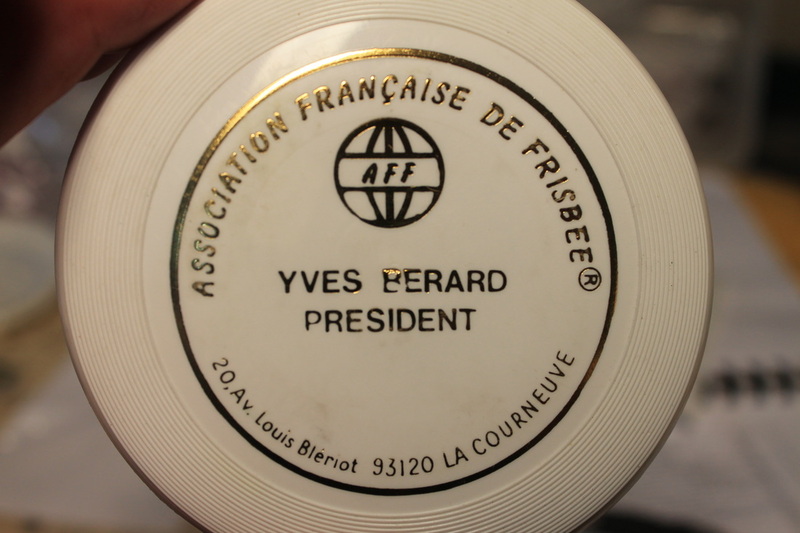 I lived in Alhambra with my Grandparents, never knew about IFA at the time. 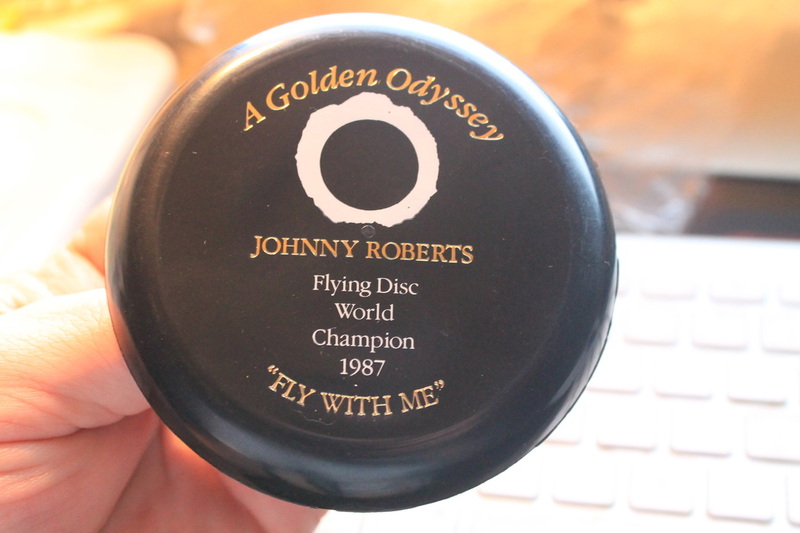 Wham-o C mold, everyone loved Johnny! Wham-o C mold, you say your a Folf champion? lets see some ID. 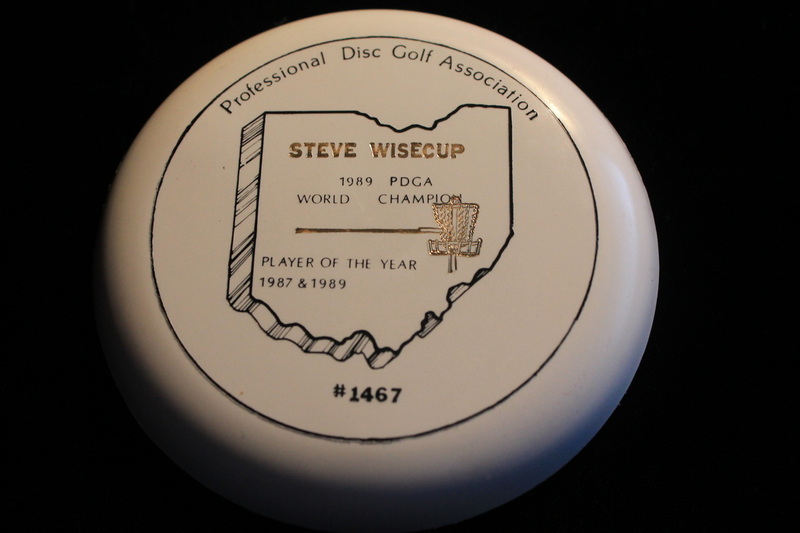 PDGA # 16. 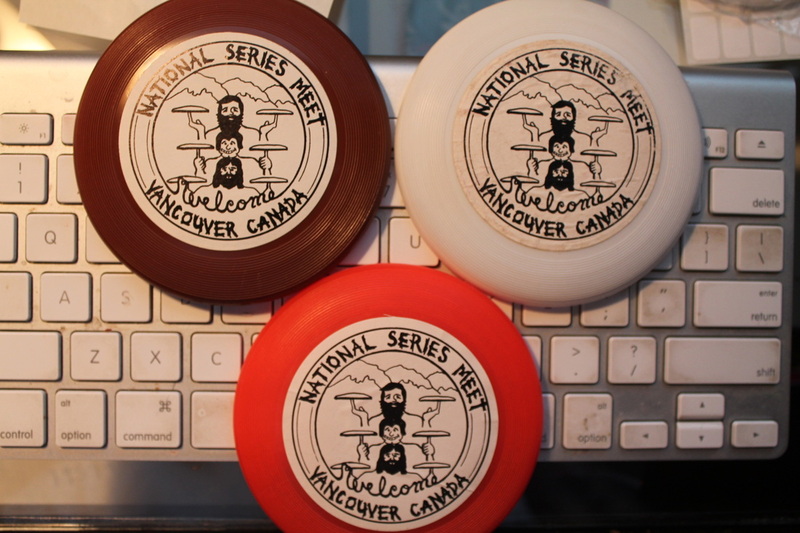 Both C molds, disc on right is a puddle mold. 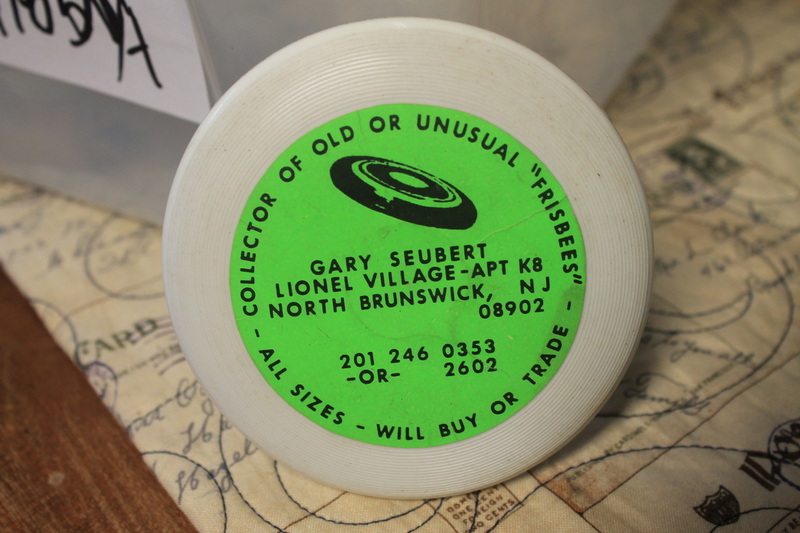 Calling Card minis from the collection of Charlie Burke. 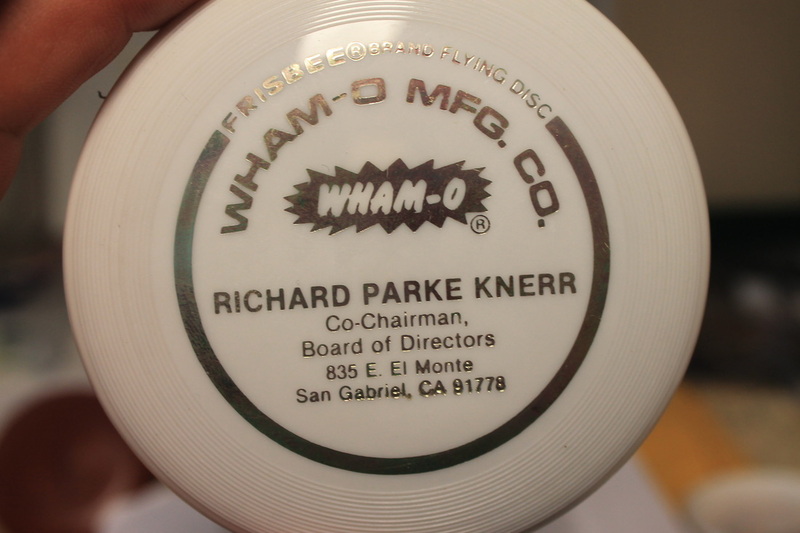 Wham-o C mold, this one looks to have a cheap photo copy of the original label, was even cut out kinda bad! 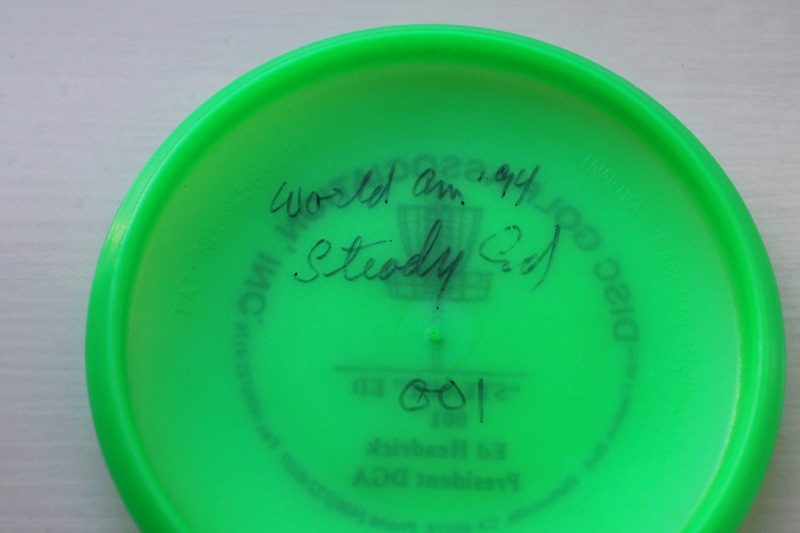 Wham-o C mold, everyone wants a low number, -1 is low! 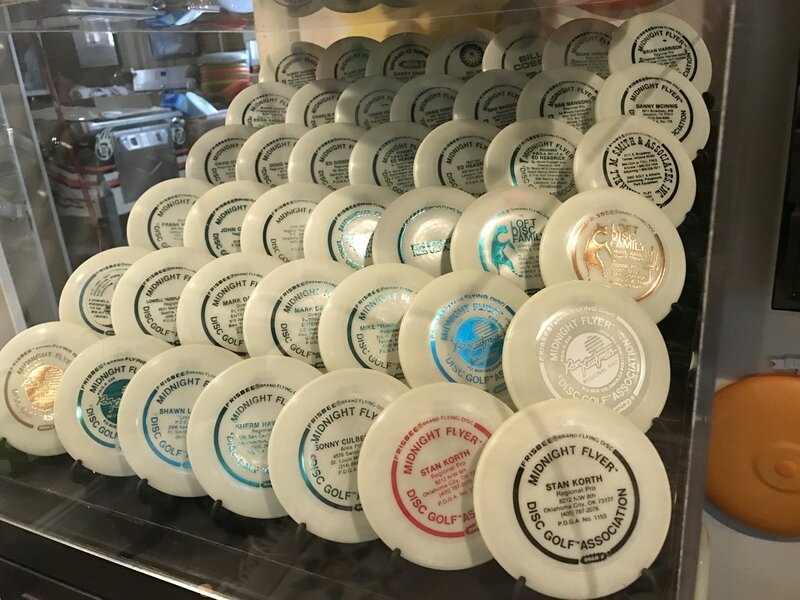 Wham-o C mold, United Flyers Of Sonoma. 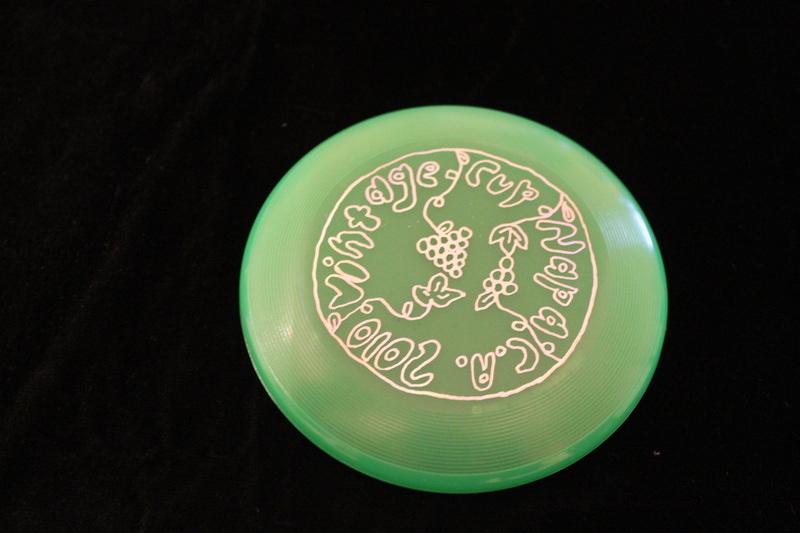 Wham-o glow mini C and D mold. 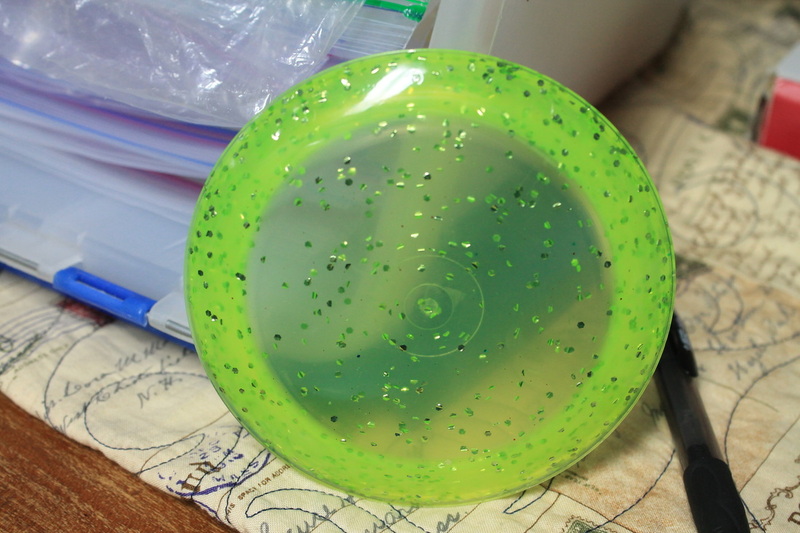 got this mini in a C & D mold. 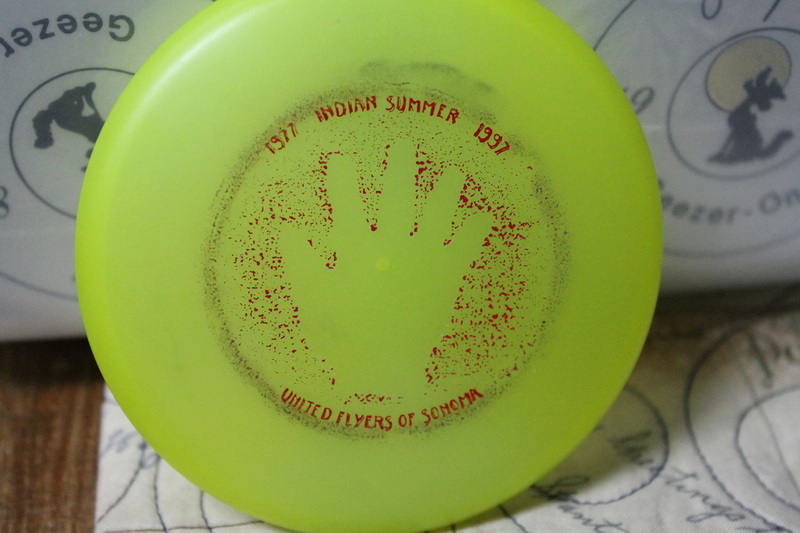 Wham-o D mold, notice the blob in the hot stamp at 10:00, see many more Ed minis at the bottom of this page. Thanks for this one Charlie! Midnight Flyer calling card minis from the collection of Charlie Burke. 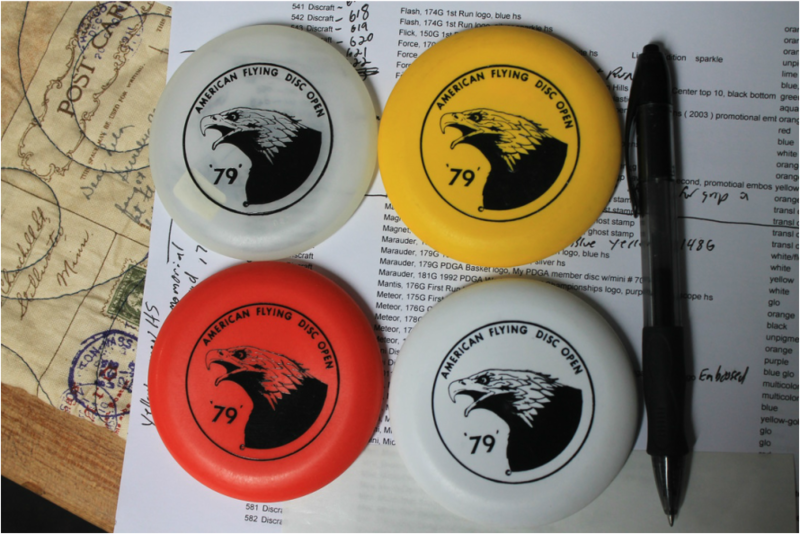 Victor's book reports that there were 100 of these minis made, I got 10! 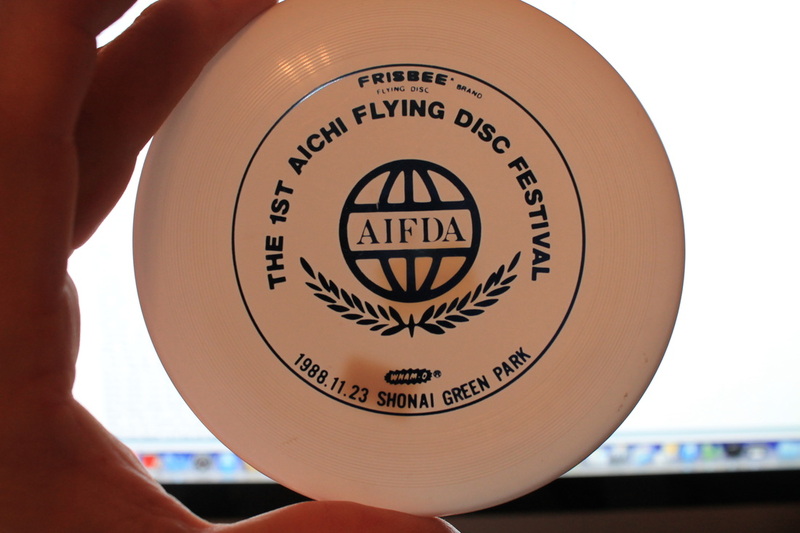 Everything I know about this disc is on the front of the disc. Now in the collection of Dudley Gaman. Unknown manufacturer, Little Big Wheel. 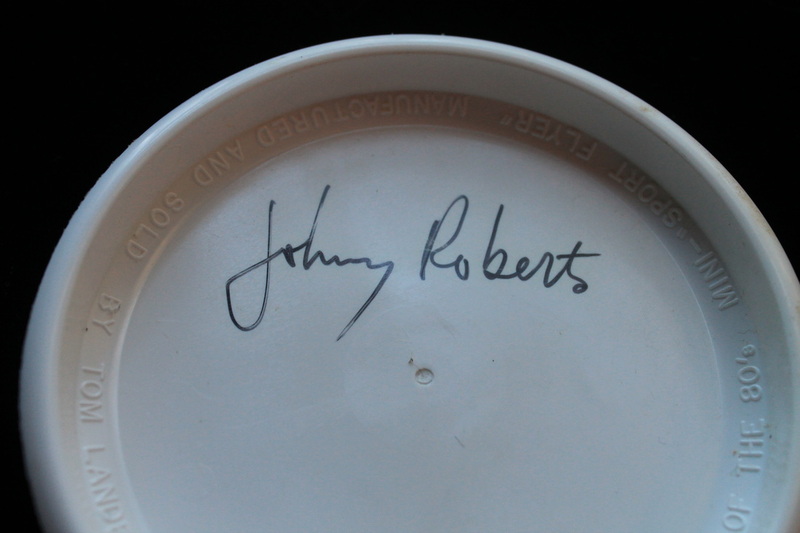 Unknown manufacturer Mickey D cup lid. Unknown manufacturer, single crown mini. Western Specialties, single crown mini. Western Specialties. single crown mini. Unknown manufacturer 4 inch mini with Ronald sticker. Now in the collection of Dudley Gaman. 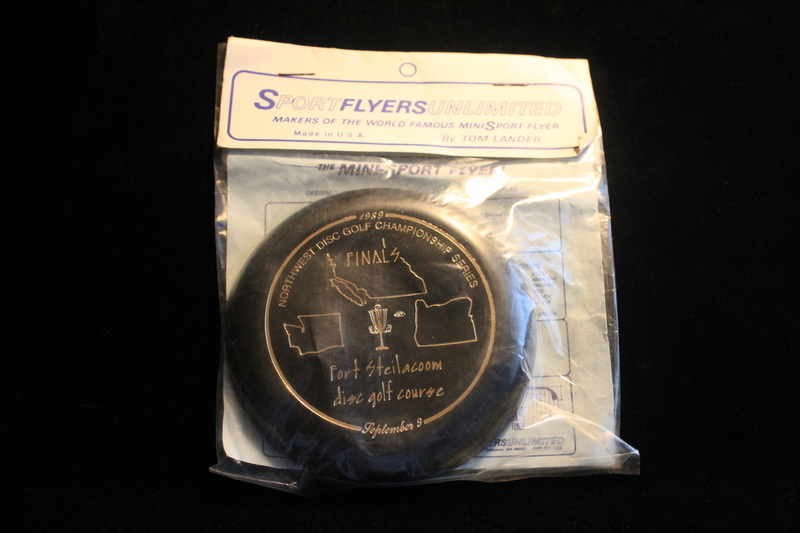 Unknown manufacturer 4 inch mini with stippled rim, GO JACKS! 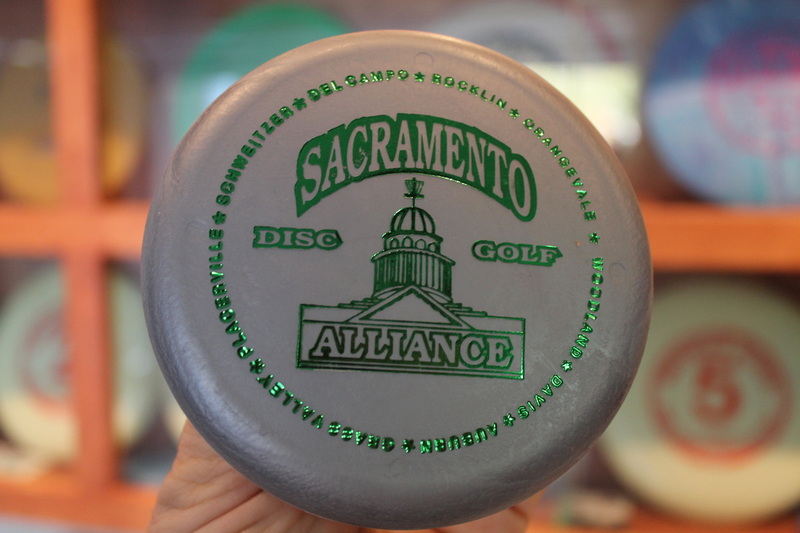 Unknown manufacturer 4inch mini with stippled rim, DTW logo. Unknown Manufacturer Floppy Flyer mini. Unknown manufacturer Burger Chef mini. 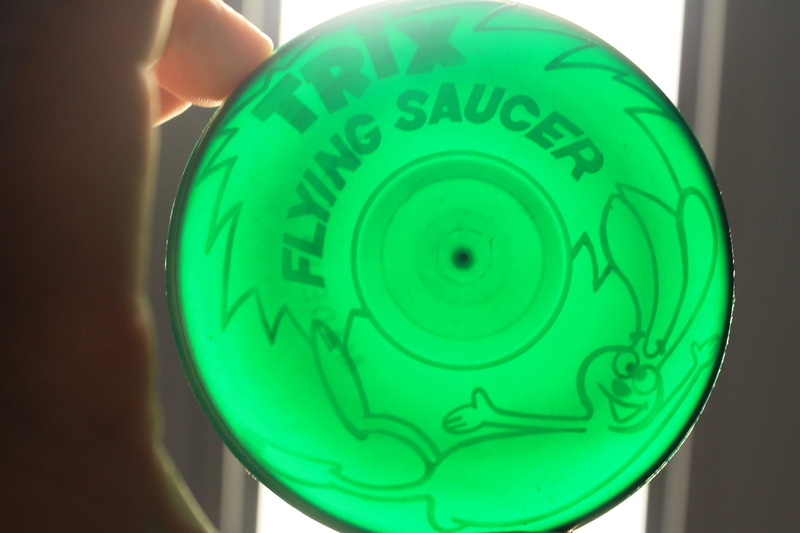 Unknown manufacturer Trix Flying Saucer. 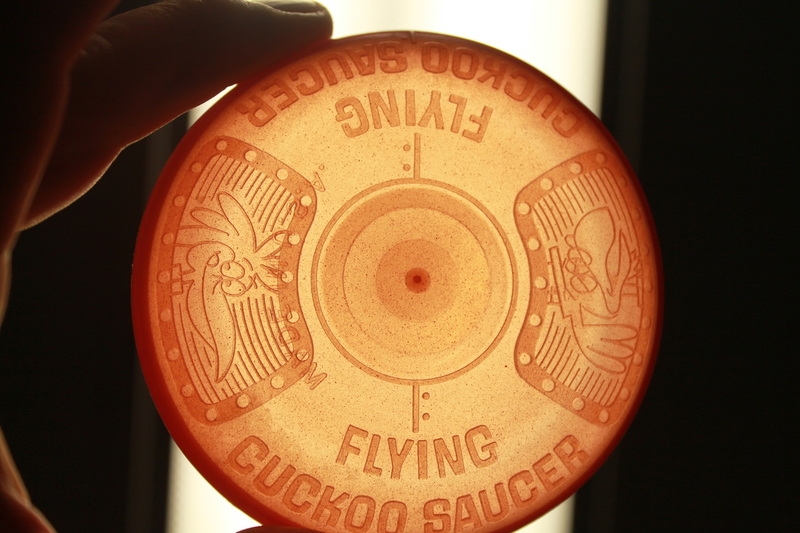 Unknown manufacturer Flying Cuckoo Saucer. 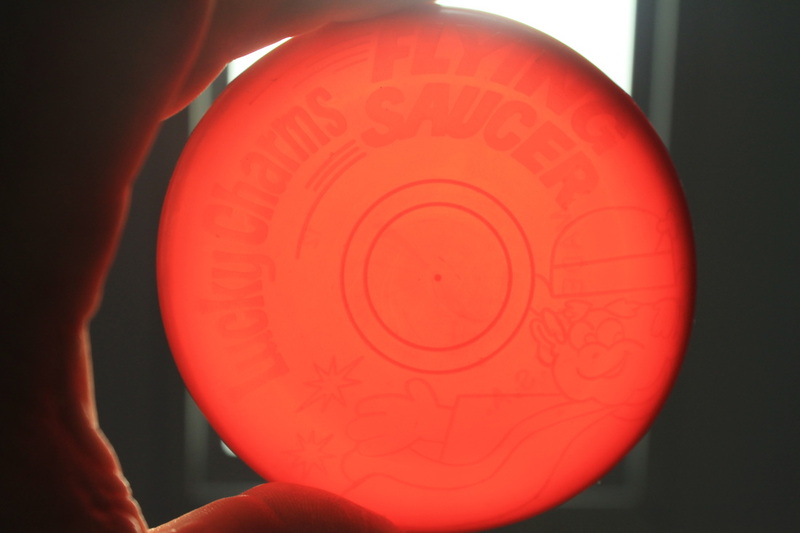 Unknown manufacturer Lucky Charms Flying Saucer. 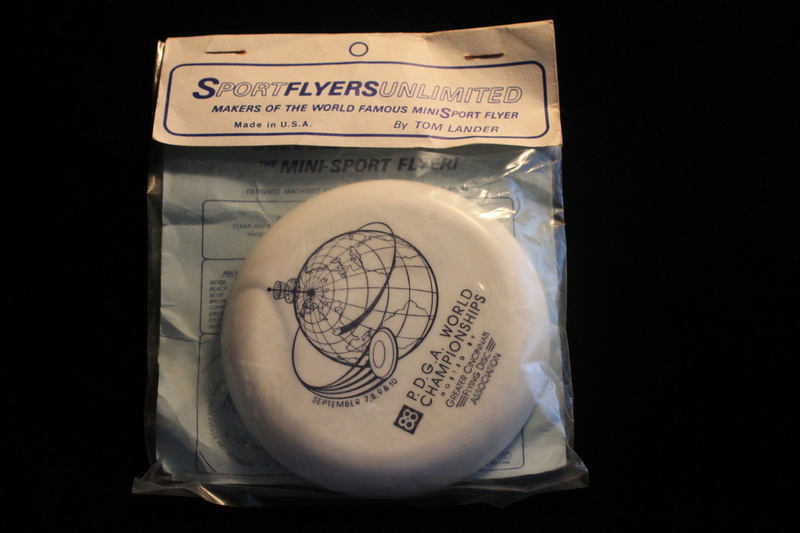 Sportflyers Mini-Sport Flyer, with insert that has mold and production info, 1981. 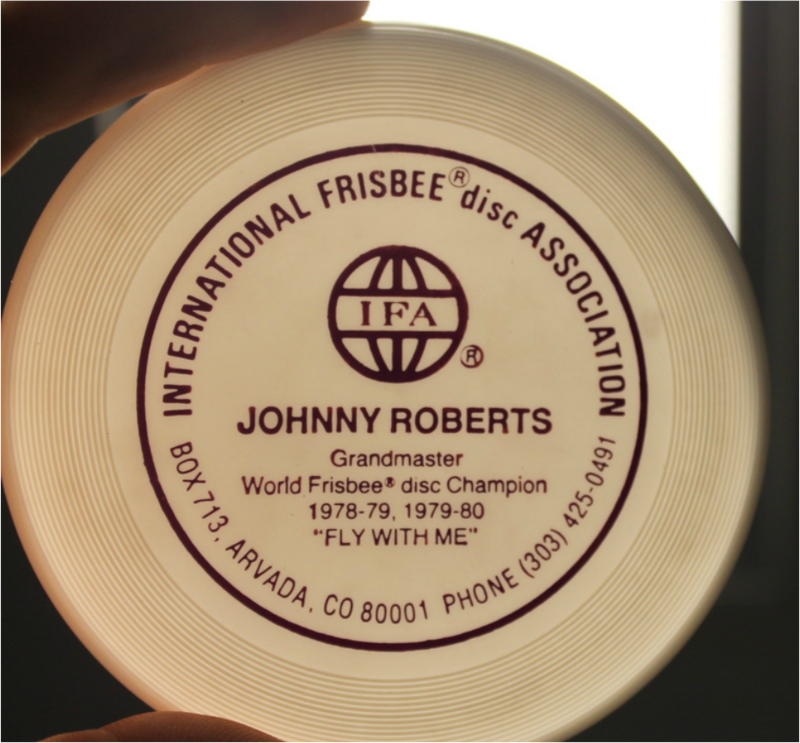 Sportflyers, Mini-Sport Flyer in the package, Tom Lander is the man behind the disc. Sportflyers, Mini-Sport Flyer, I think this course is in the Seattle area. 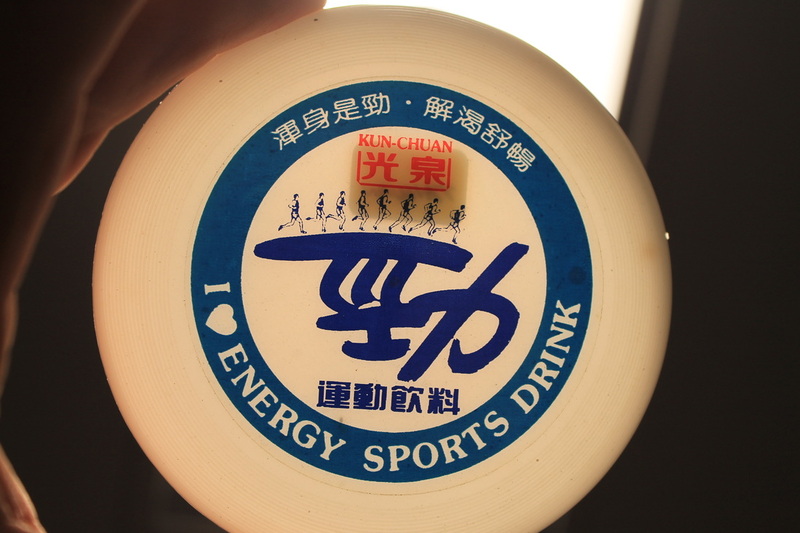 Sportflyers, Mini-Sport Flyer, these are test plastic discs white is super gummy, black is medium gummy and grey is super stiff. 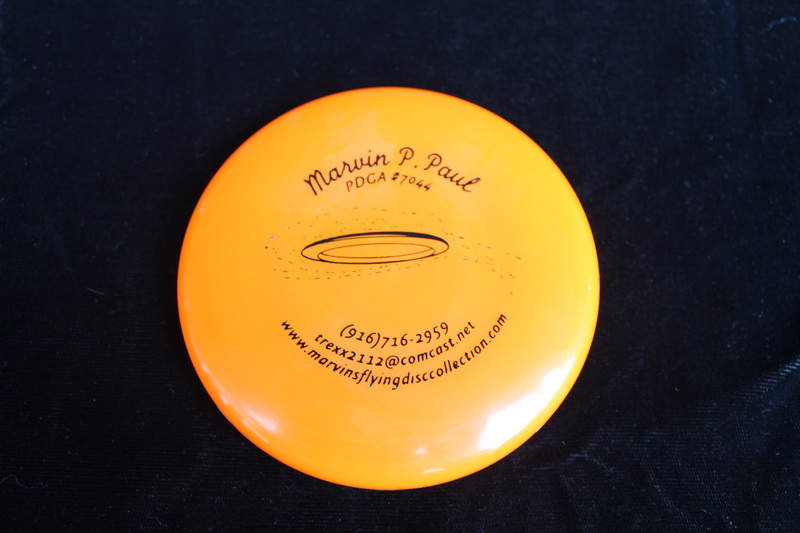 Sportflyer Mini-Sport Flyer, prototype discs, no script on the underside, softer plastic, crazy colors. 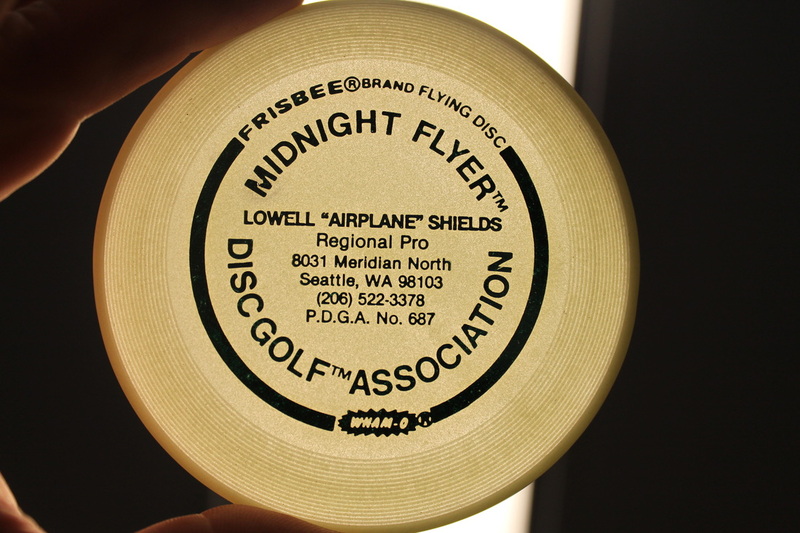 Sportflyer, Mini-Sport Flyer, 1990 logo on a glow disc. 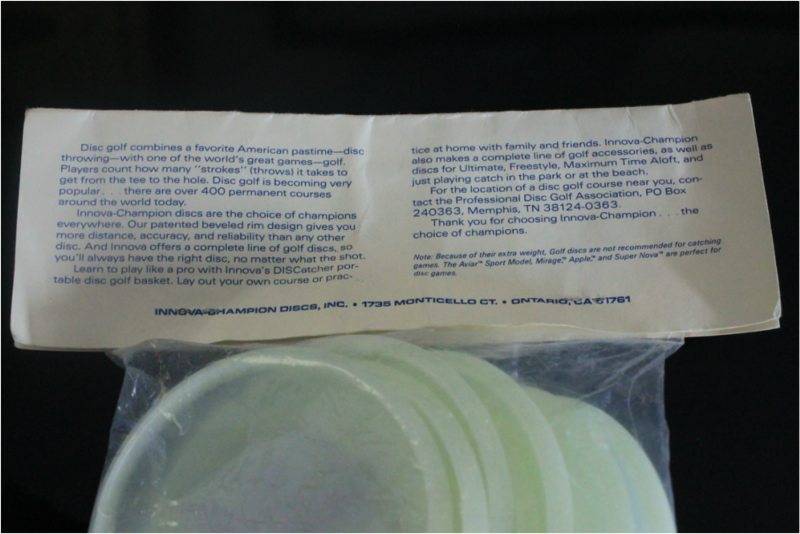 Sportflyer, Mini Sport Flyer, in stapled bag, has info insert like above, mold & production info. 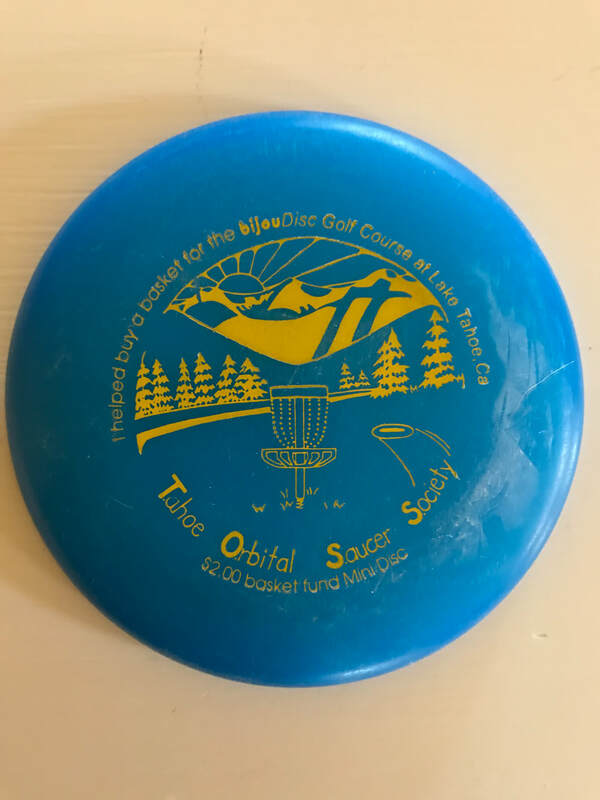 Sportflyer, Mini-Sport Flyer, super hard plastic, my notes say it was used as a trophy, hole in center. 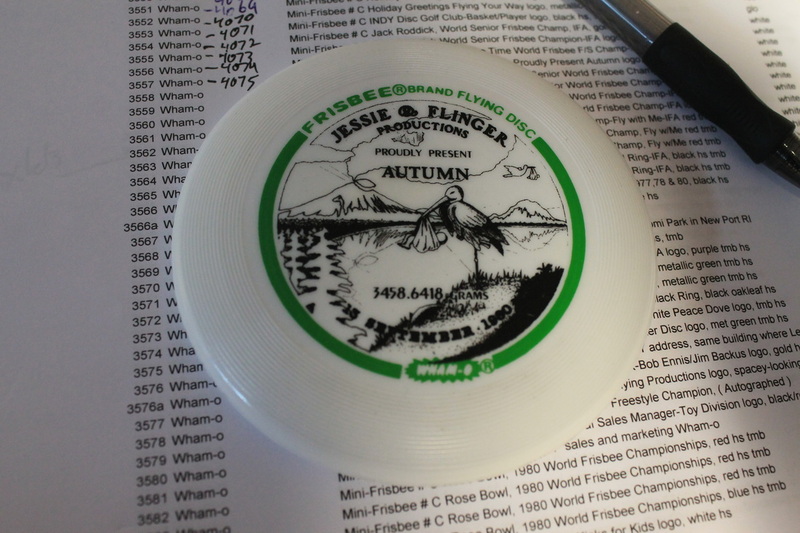 My notes say Innova mini but with flight rings? 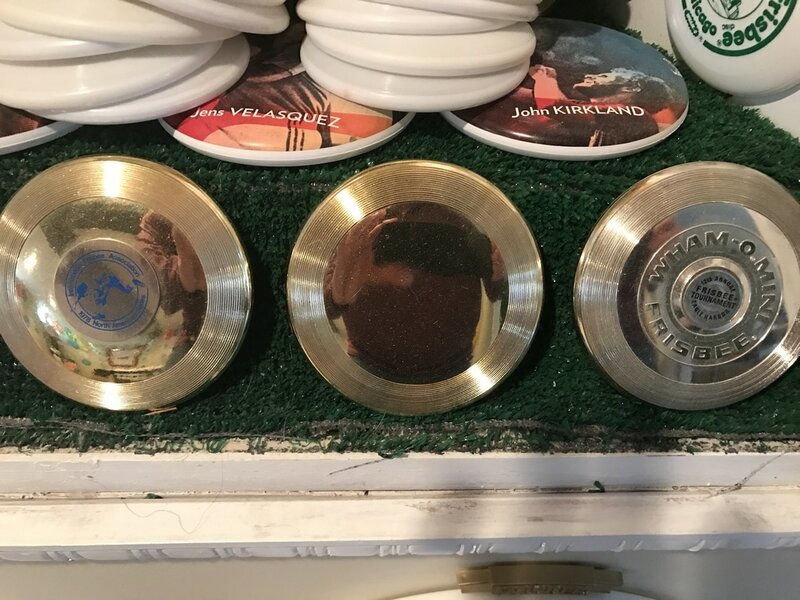 3 cool pins! 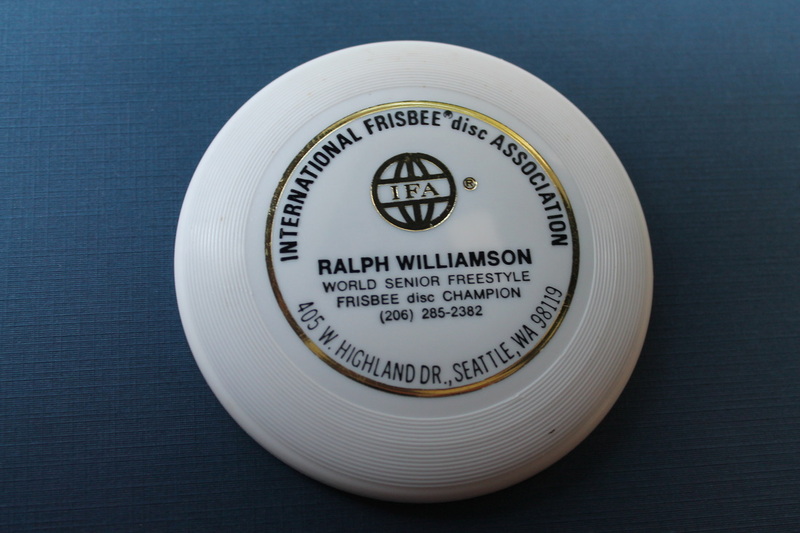 Innova mini, First time I met Ralph he presented me with his card. 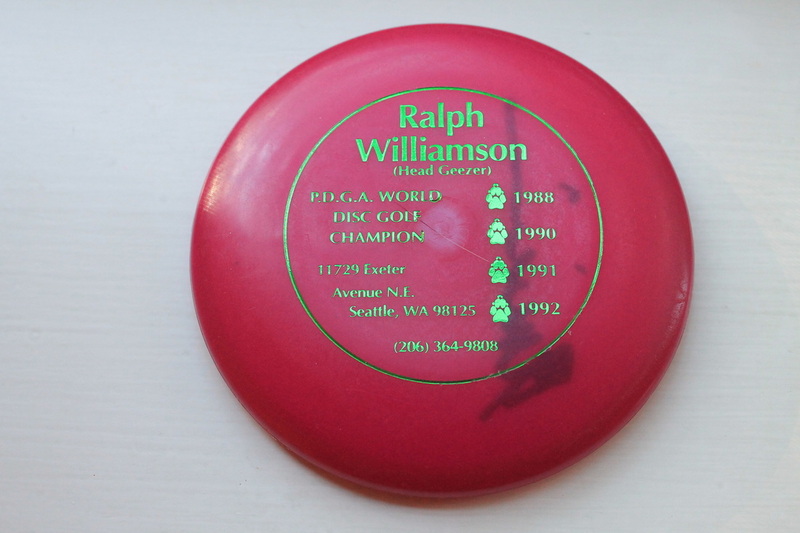 Innova mini, Ralph Williamson was a 10 time Disc Golf World Champion, can someone tell me why he is not in the Hall Of Fame? 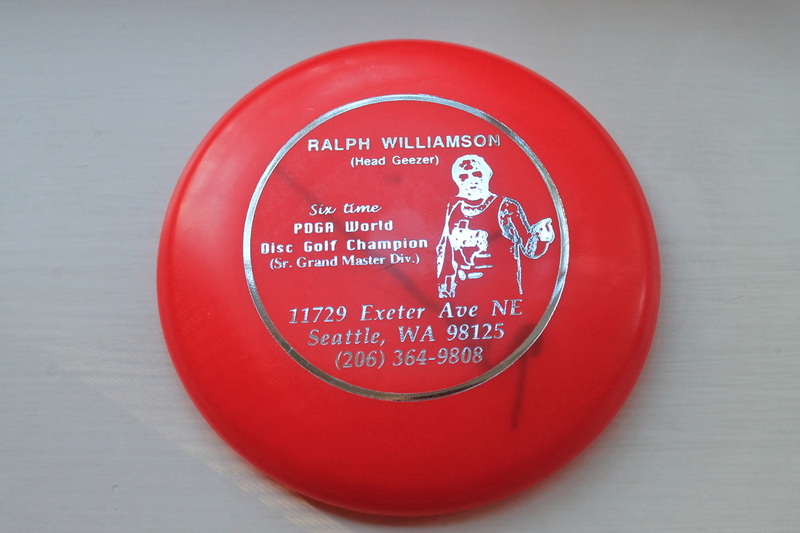 Innova mini, Ralph Williamson's card. 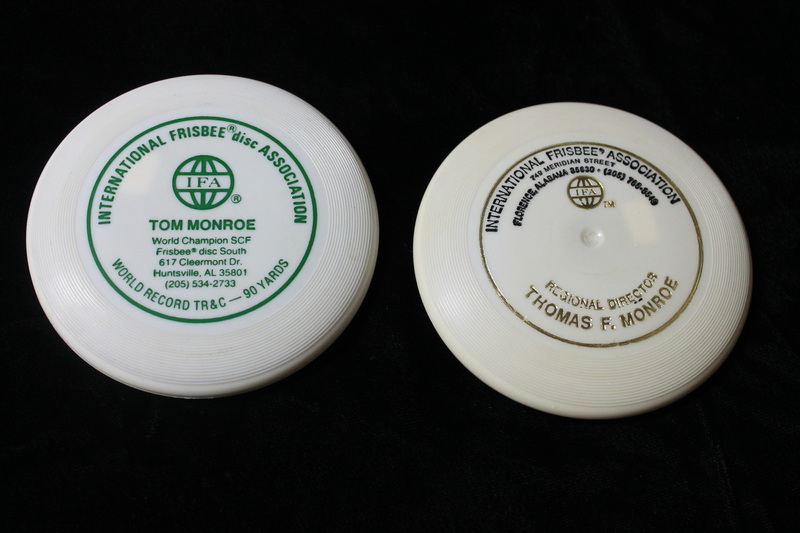 2 sport Flyers & 2 Innova, Ralph Williamson calling cards, from the Collection of Ted Barber. 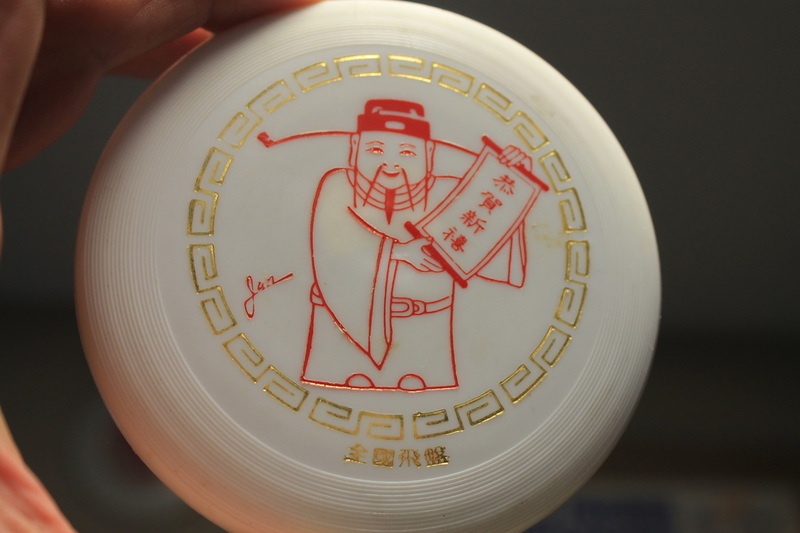 Innova mini, Popeye logo disc also says Disc Communication, my notes say Japan Professional Disc Golf Association zippered case, not sure if these go together? 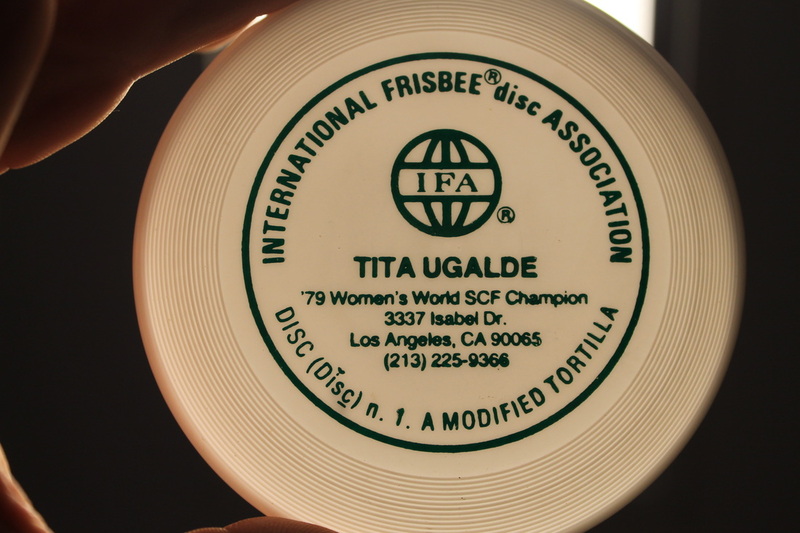 Innova mini, 1993 World Overall Championships-San Diego Free Flyers logo. 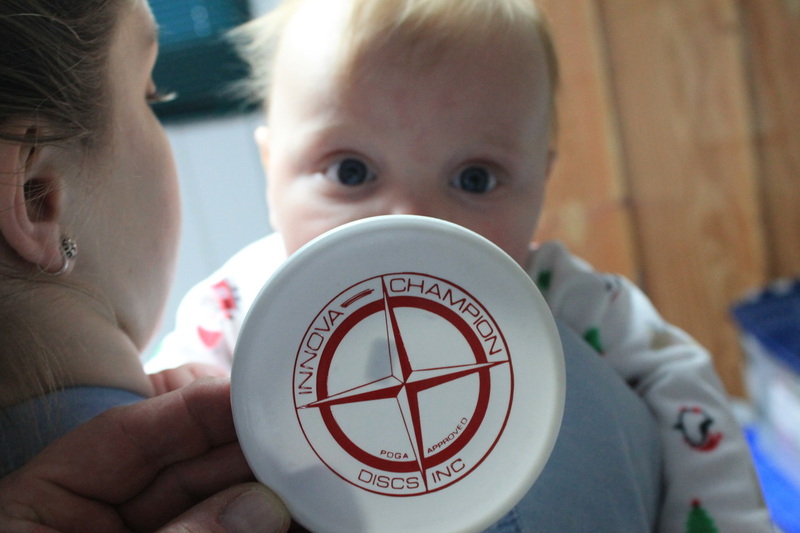 Innova minis first run Champion Plastic. 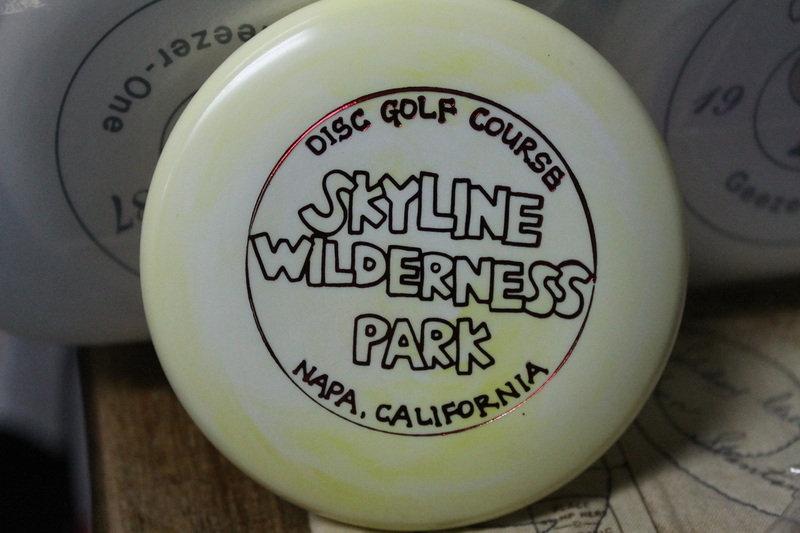 Innova Full color mini from the SF Safari. 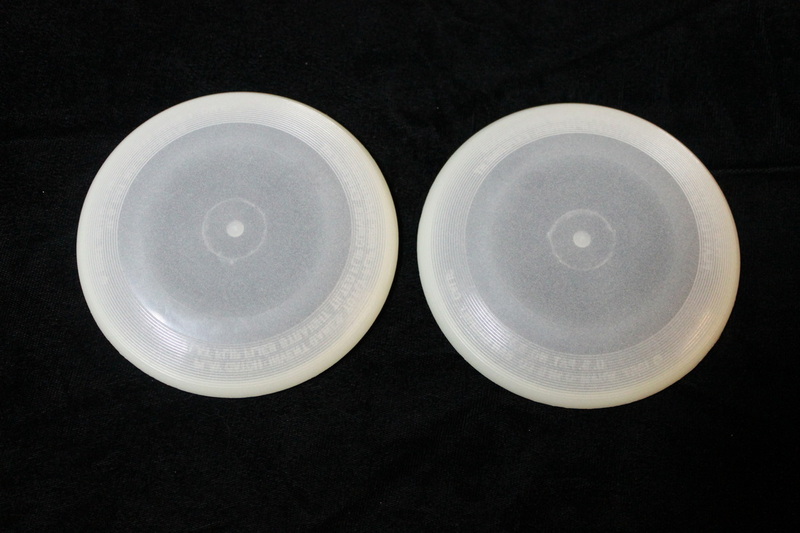 Innova Gorbee Flyer, one on right is heavy in weight. 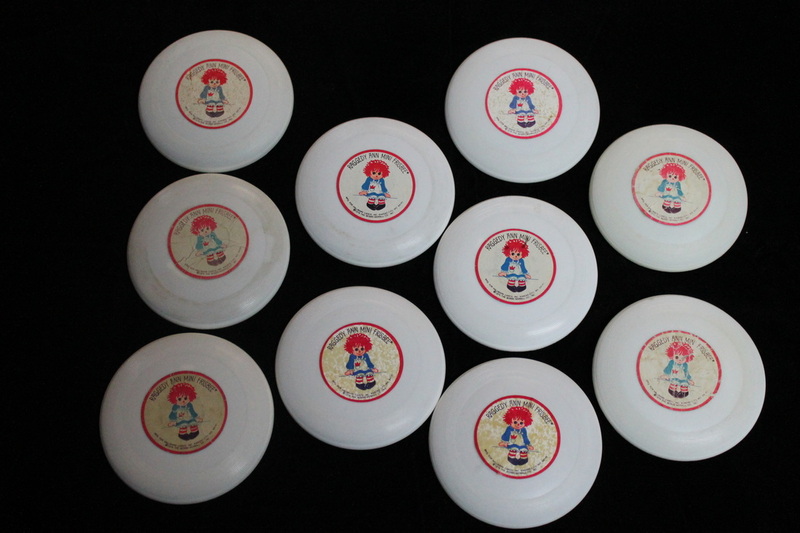 Set of Innova minis from the 2004 Vintage Cup held at Skyline Wilderness Park in Napa California. 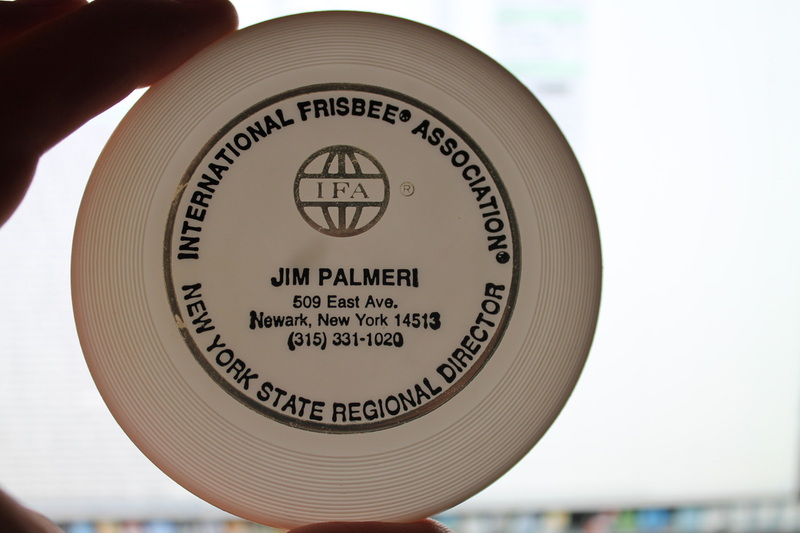 Innova mini, from one of the first events that I cashed in, I had to leave before the awards but I did get my payout in the mail, I guess that is why Charlie Callahan is in the Hall of Fame, doing things right! 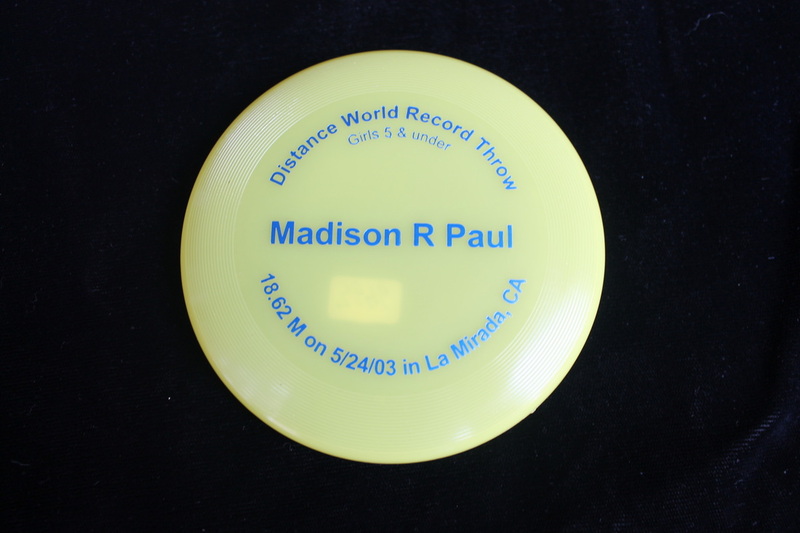 in 2013 Gold Pan will have its 35th event. 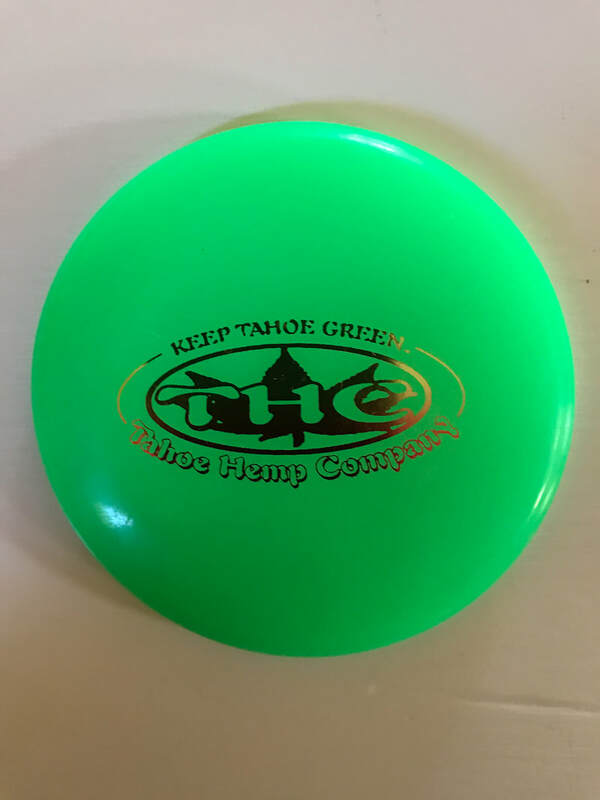 Where is the Frisbee Rancher? 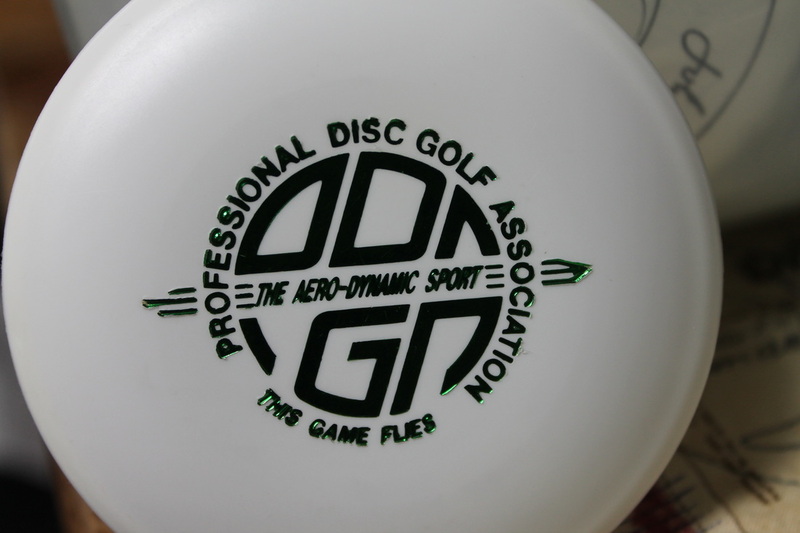 Innova mini, here is a PDGA logo you do not see very often. 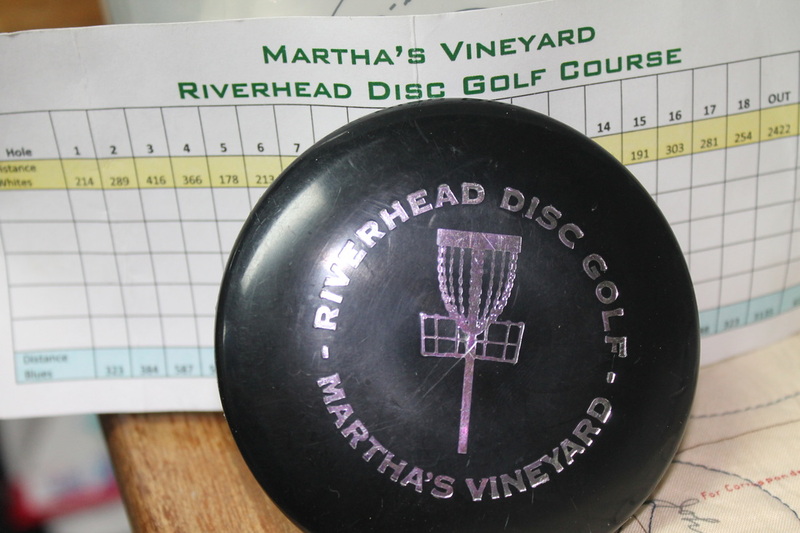 Innova mini, loved taking the boat out to play this course. 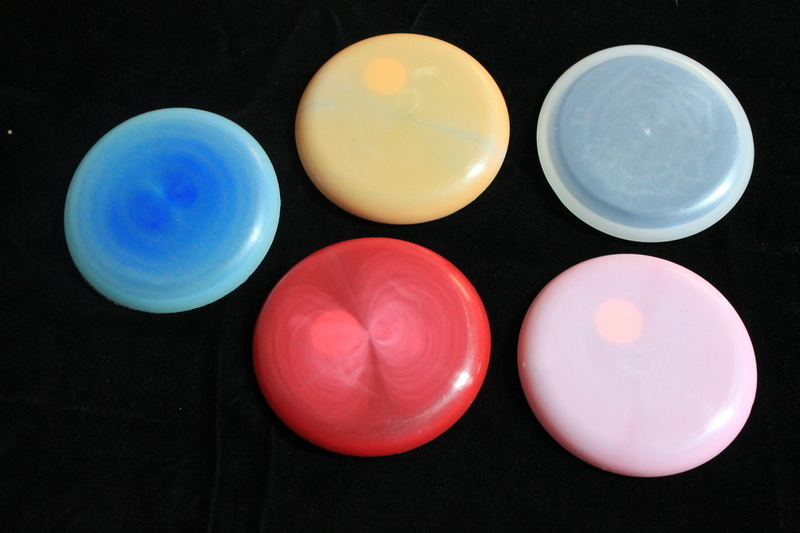 Innova mini, swirly star plastic. 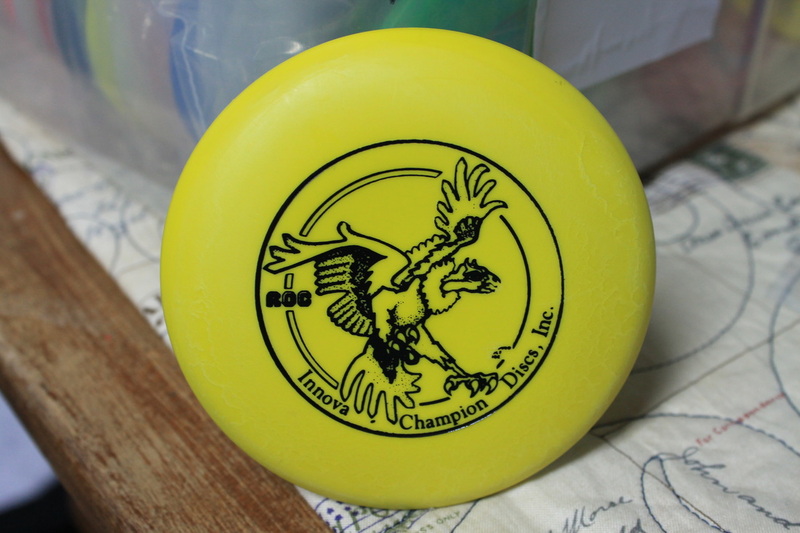 Innova mini, Champion Edition plastic. 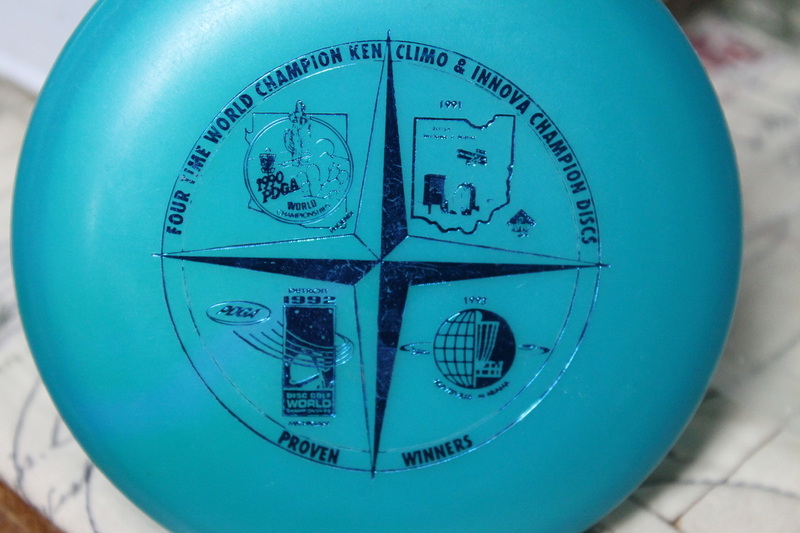 Innova San Marino mini, this is the first of the star stamps, the single solid inner ring had many drop outs so they went to a double inner ring, 1984. A set of Wham-o John Kirkland minis. Wham-o mini set from 1970. Wham-o mini set from 1968. 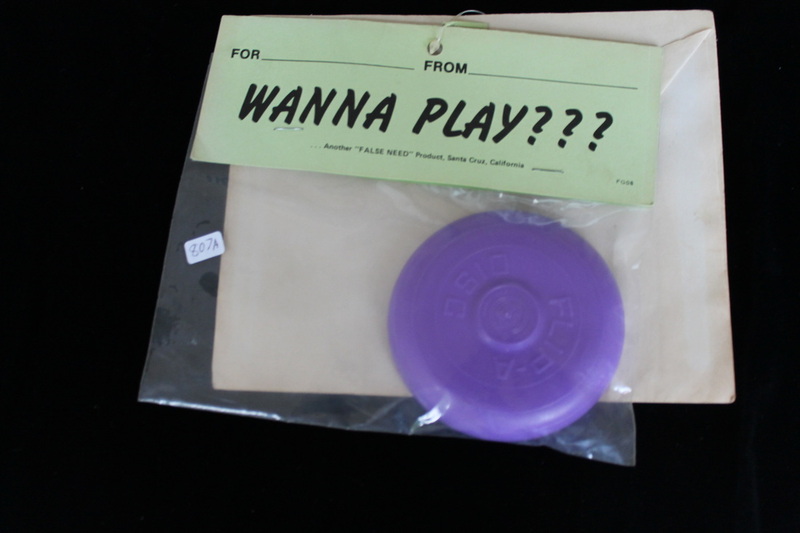 Wham-o mini set from 1968. these discs have the 3 over 2 ring paper label. 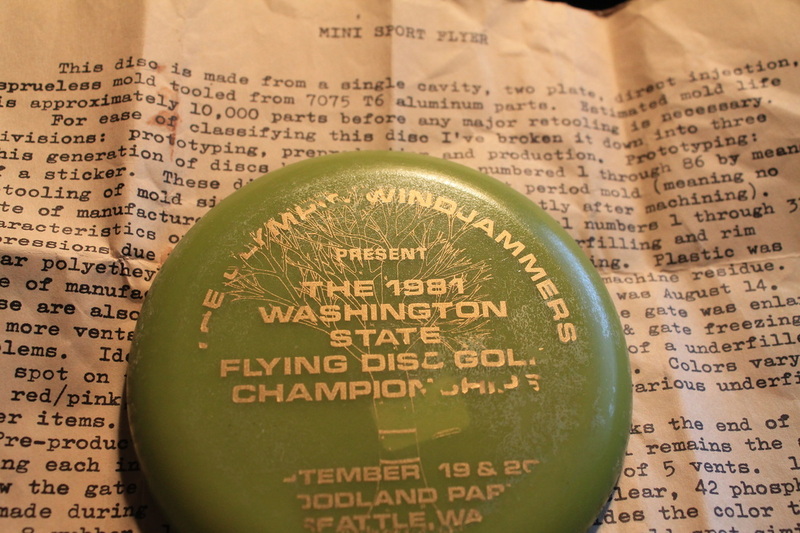 Wham-o Mini Frisbee 4 pack set, 1967, lettered, puddle Pro's, all 2 over 3 Olympic paper labels. Wham-o mini glow set. 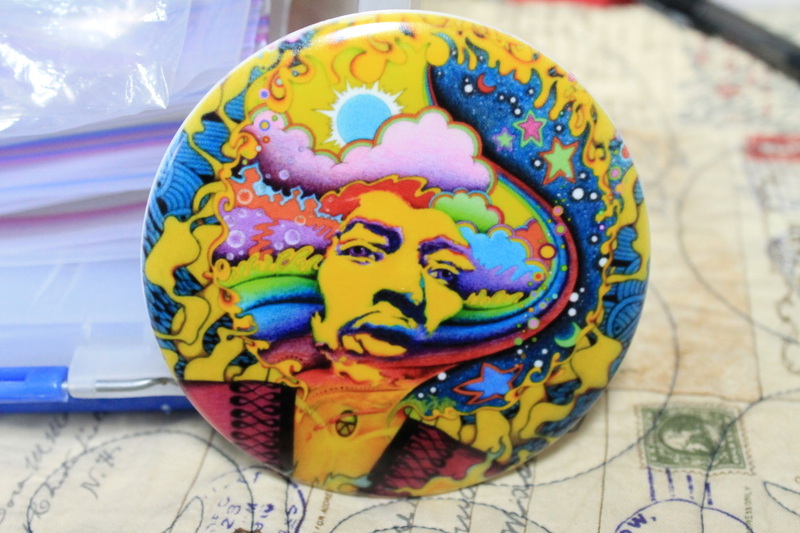 MINT like the day it was packaged, 1969. 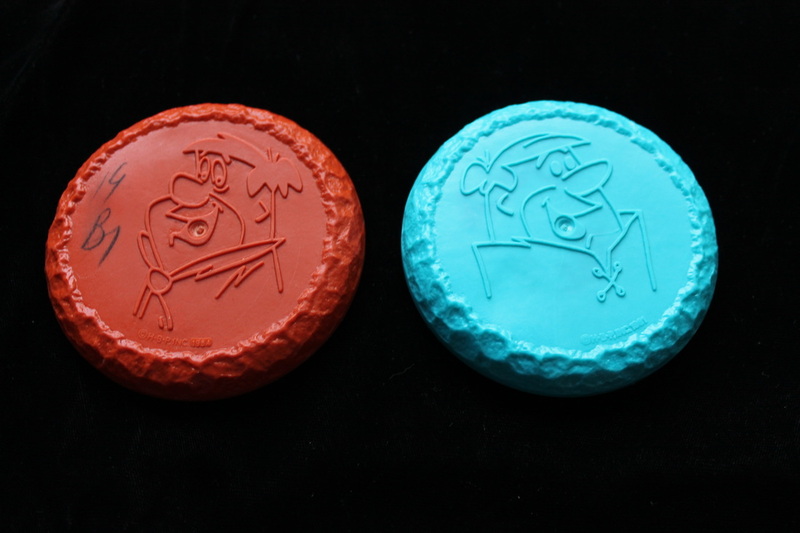 Wham-o no # mold, blank glow minis. Unknown manufacturer, mini set from Japan. 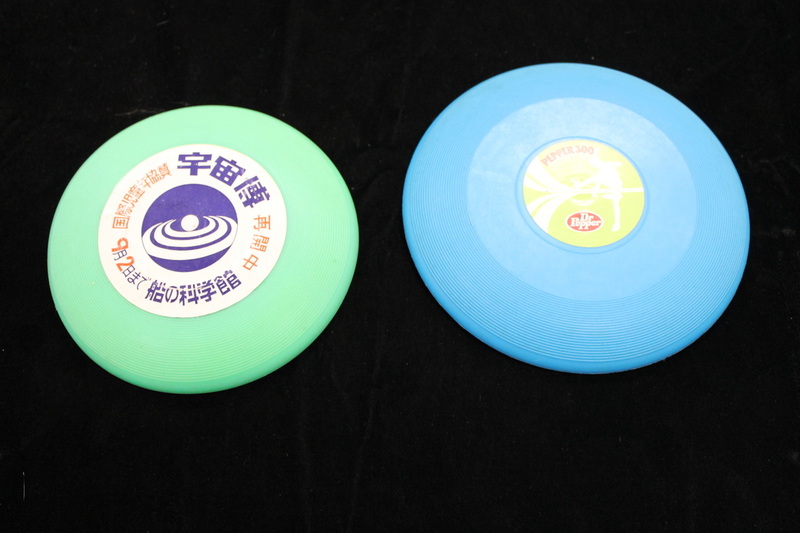 Unknown manufacturer green disc is 5" and blue disc is 5 3/4" both from Japan. 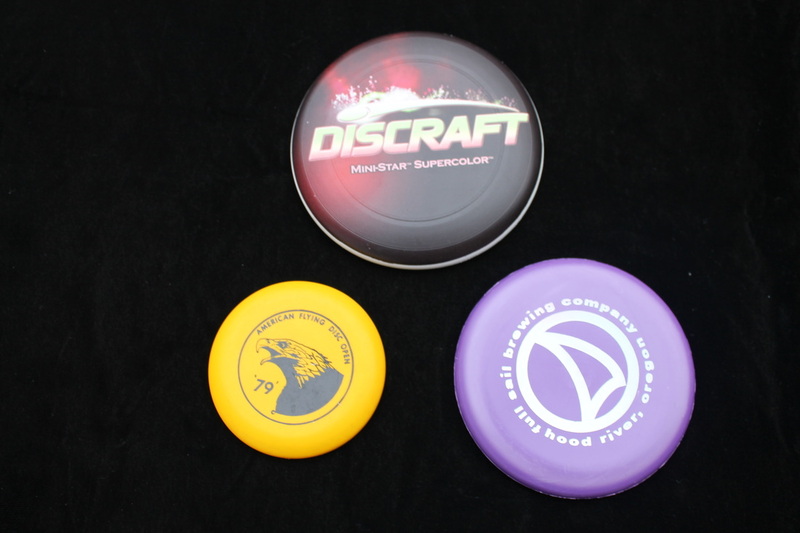 Discraft MiniStar, Mini Magnet and Micro Mini. 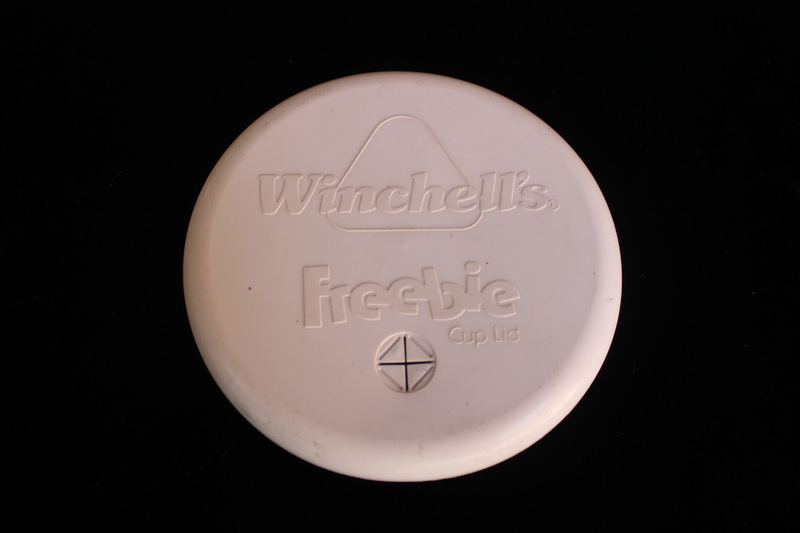 Unknown manufacturer Winchell's Frisbie cup lid. 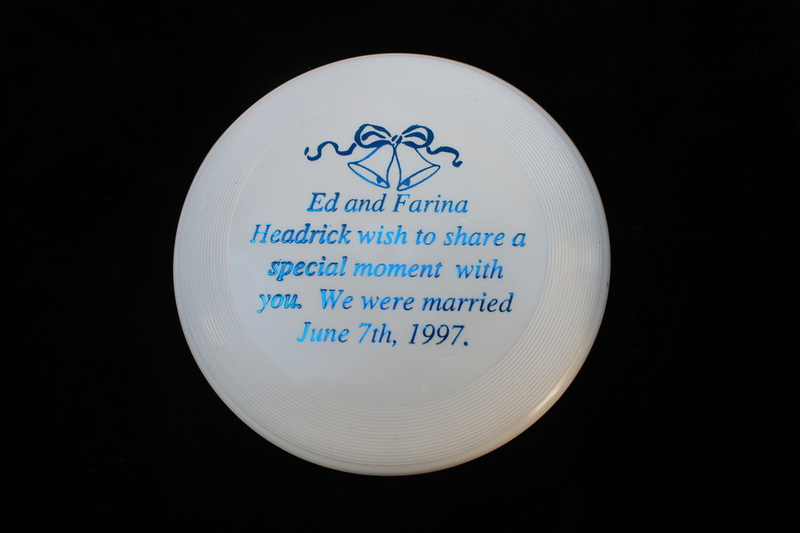 made under the trademark of Frisbee by Wham-o/Farusa. Tesco Epix tm technology, computer engraved pic when held to light looks like a 3D picture. 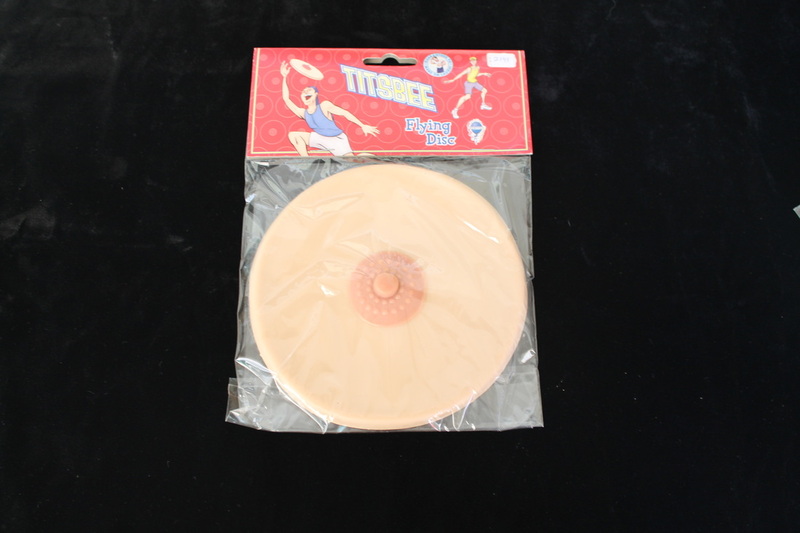 Pipedream Titsbee 5 1/2" rubber disc. 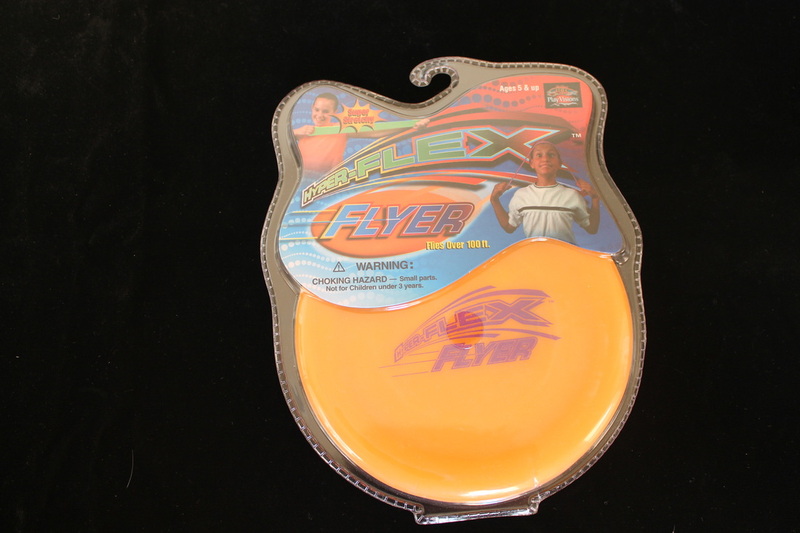 Play Visions Hyper Flex Flyer 4 1/2" rubber disc. Papco Single Crown mini with bent in spoilers. Wham-o # 7 mold, artwork by Madison R Paul. 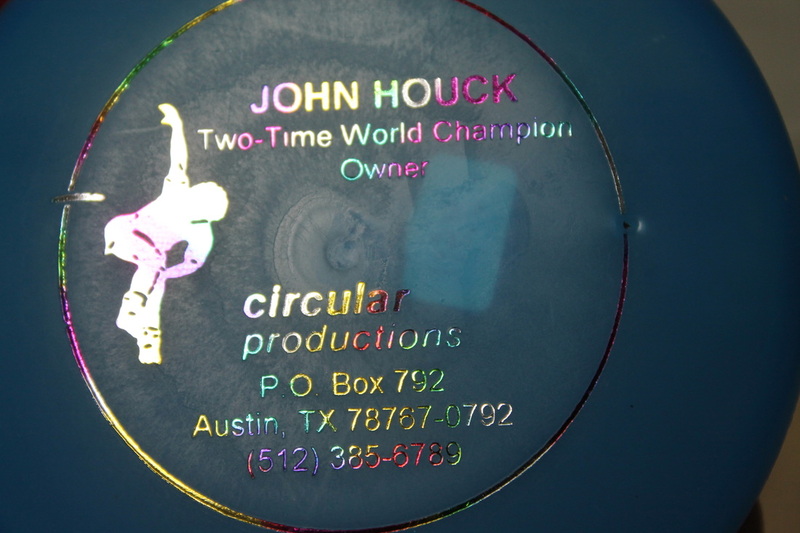 Mini- Flyer, logo is circa 1995. Larami ( chinese ) Flying Whizzies. 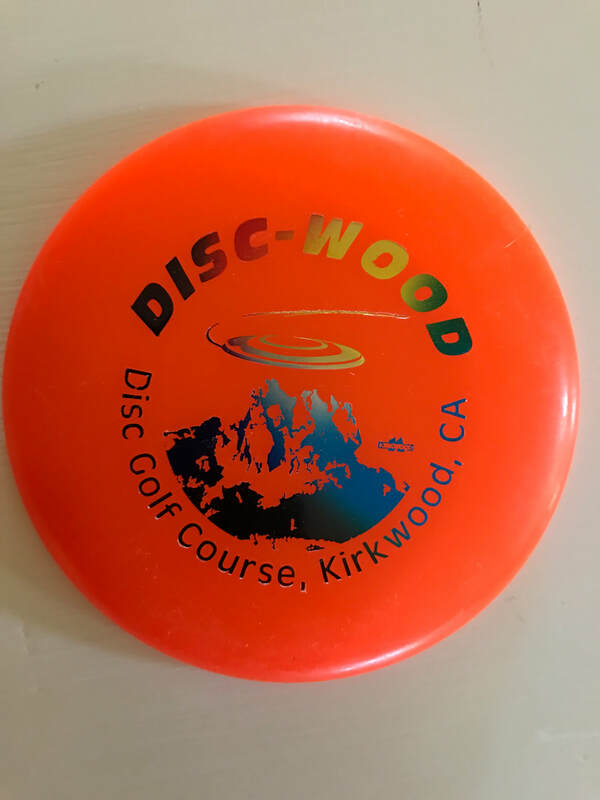 has ideas for many disc games. 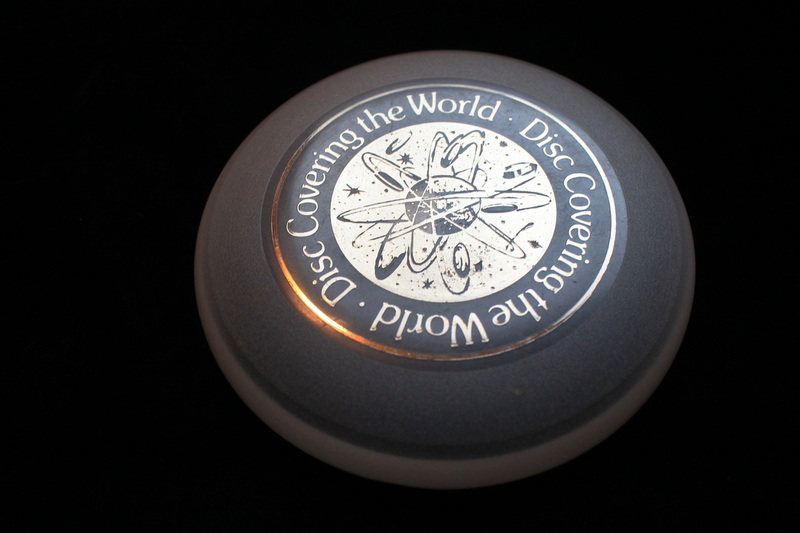 Wham-o Pocket Pro 30A & 30 B molds with Midnight Flyer logo, these discs are glow in the dark. Wham-o mini C mold, I liked Gary's mini so much I just about did a copy of his. 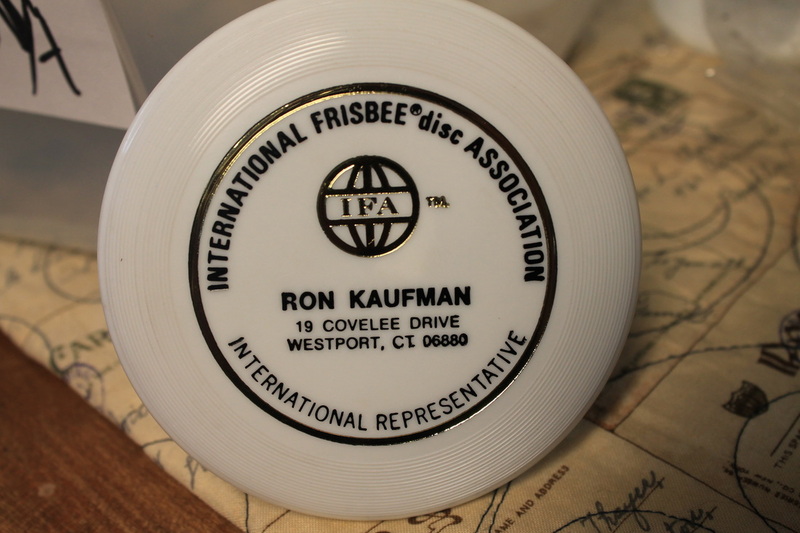 Imperial Flip-A Disc mini, this one came with a header card and a envelope. 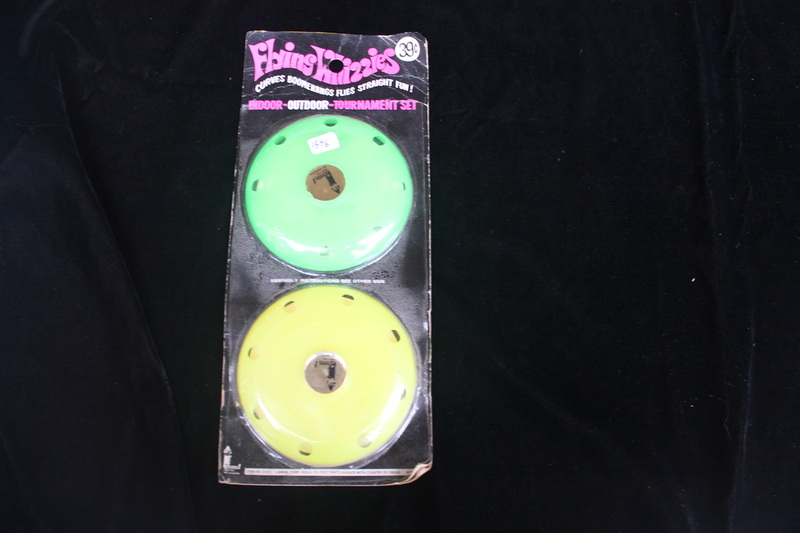 Grace Toys Mini Sanders Mini Package of 3 single crown discs with flight rings. 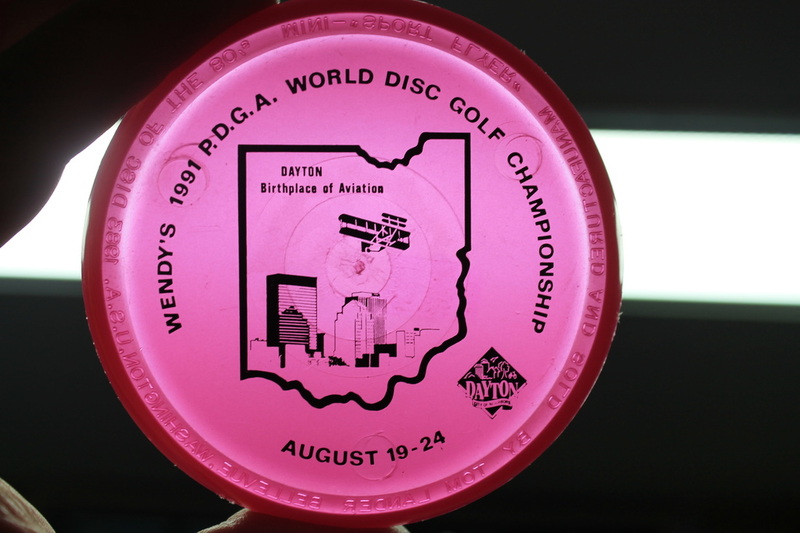 Wham-o Mini discs all C mold , Midnight Flyer/ Disc Golf Association logo, player line. Night Lighter set from Japan.